Turkey is a country that has, so far, managed to maintain relative neutrality in a region that is fraught with religious acrimony. Syria, Iraq and Iran are on its Eastern and Southeastern borders. It has a secular government over a principally Muslim population. Turkey has been blocked from joining the European Union but has benefited from the weakness of the Euro. Former French president Sarkozy reportedly blocked Turkey’s entry due to Turkey’s unwillingness to recognize Cyprus. Turkey’s currency is the Turkish Lira but merchants are by and large agnostic as to whether one pays with Euros, Lira, or U.S. Dollars. We started our trip with a non-stop flight from Chicago to Istanbul on Saturday May 19, landing on Sunday early evening. 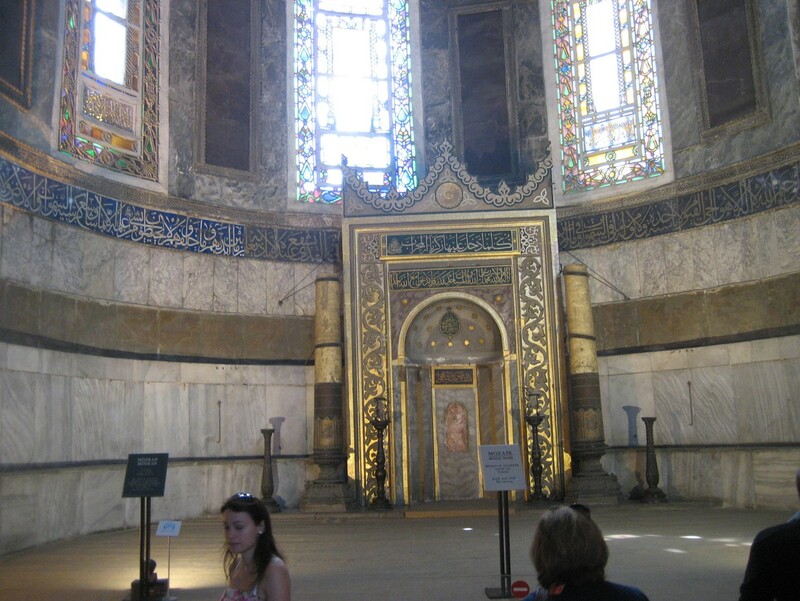 We wanted to delay the touring of Istanbul for later in the trip when we weren’t hampered with jet lag. 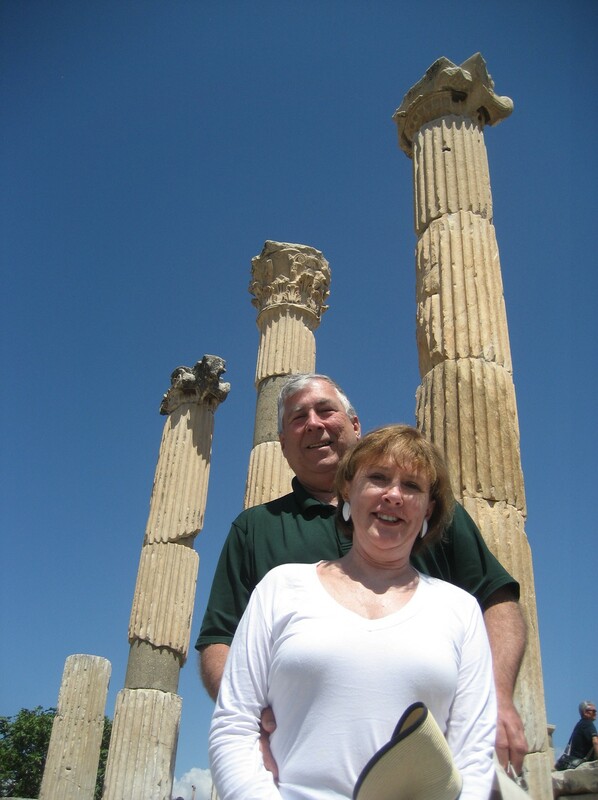 We spent the night in a hotel at the airport then got on a flight to Antalya the next morning. It was a good thing we planned this way because it took us an hour in line to get a visa and another hour in another line for passport control. We would have missed any attempt at a connecting flight. Customs by contrast was little more than a sign over the exit. Go figure. 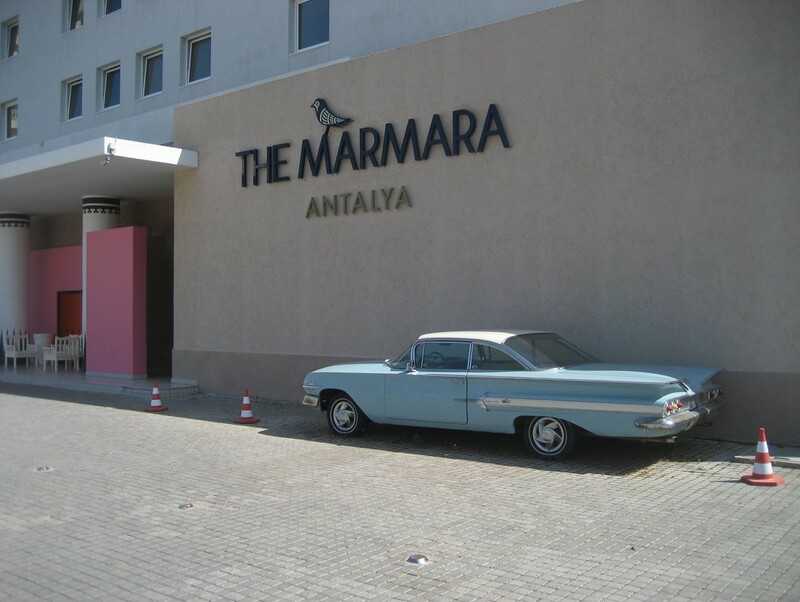 The flight to Antalya was only an hour followed by a 30-minute cab ride that brought us to The Marmara hotel which sits right on the Mediterranean. The hotel didn’t look like much from the outside, but the rooms were very nice and the grounds were quite impressive. 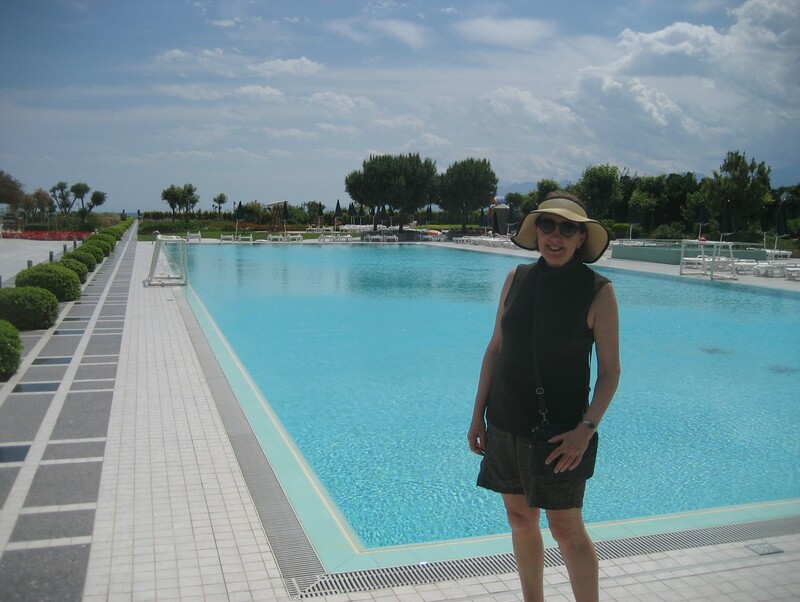 Right away Pat noticed the large, long swimming pool, which made her very happy. Interestingly, the reception was on level 7 and the pool and dining facilities were on level 6. We discovered the reason for this when we walked out to the end of the property and looked down. 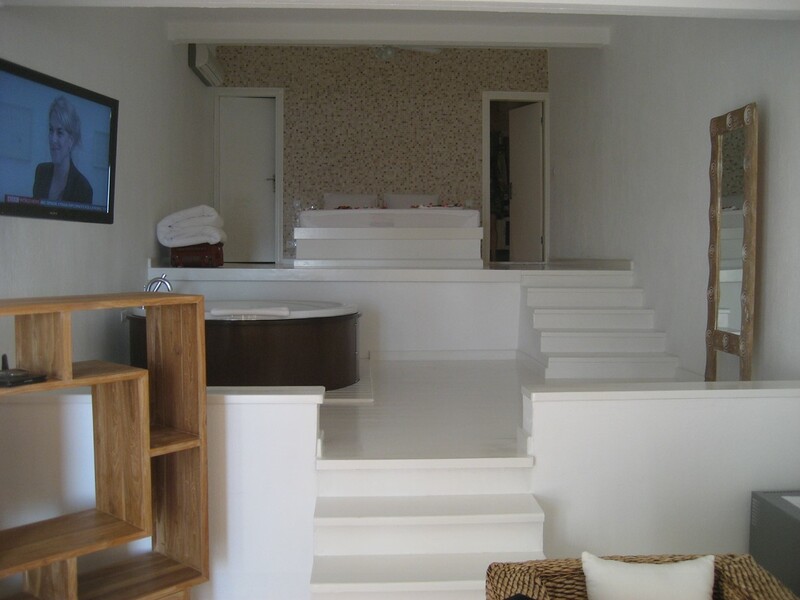 This is the beach swimming and sunning area for the hotel and it is at level 0. It took some searching but we found an elevator that took us down to the beach level. 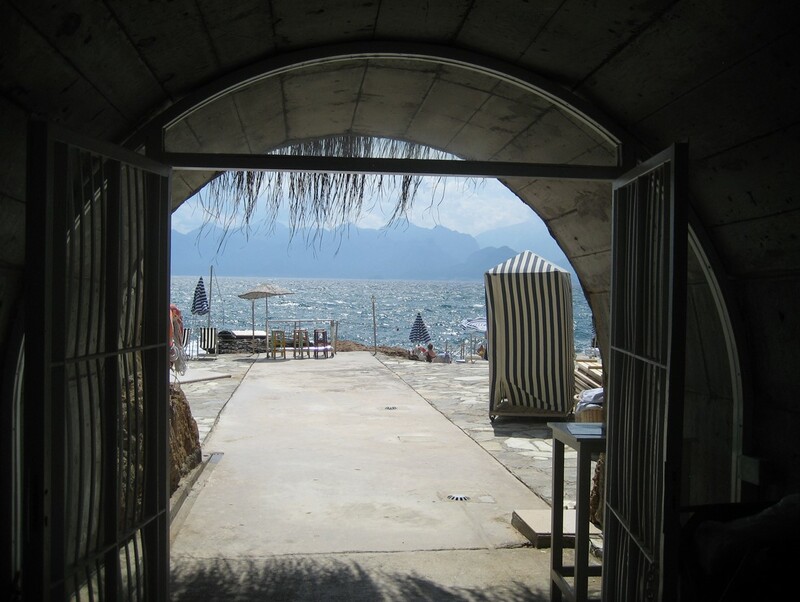 One exits the elevator then follows a tunnel that leads to the beach area. We spent most of our first afternoon on the beach chairs. 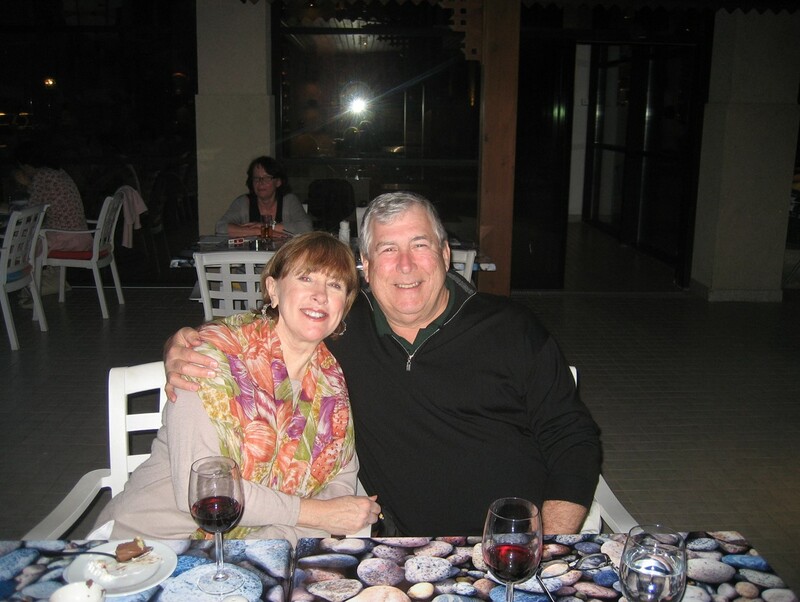 We elected to have dinner at the hotel and begin our adventures the next morning. After breakfast we took a cab to Old Town (Kaleici). 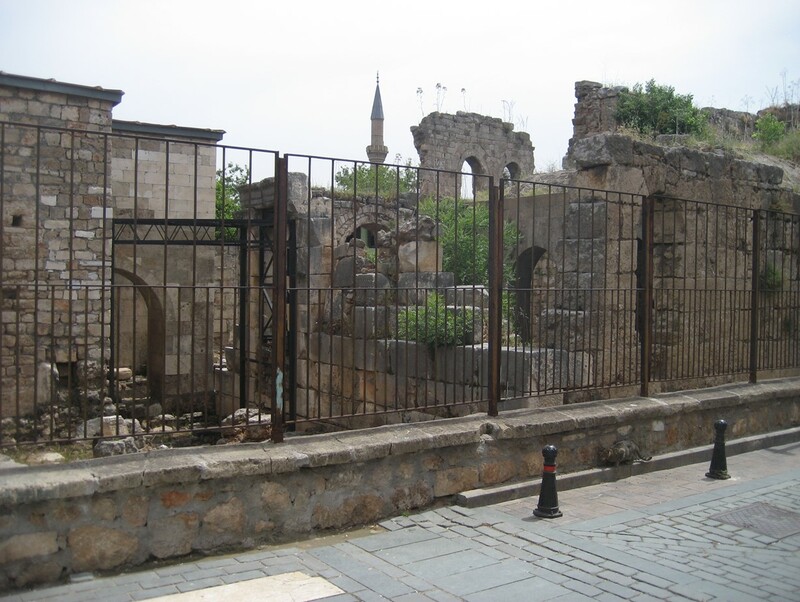 This area is enclosed by a fortified city wall and is from the Ottoman period. We entered through Hadrian’s Gate. Here a local merchant displays dozens of spices. 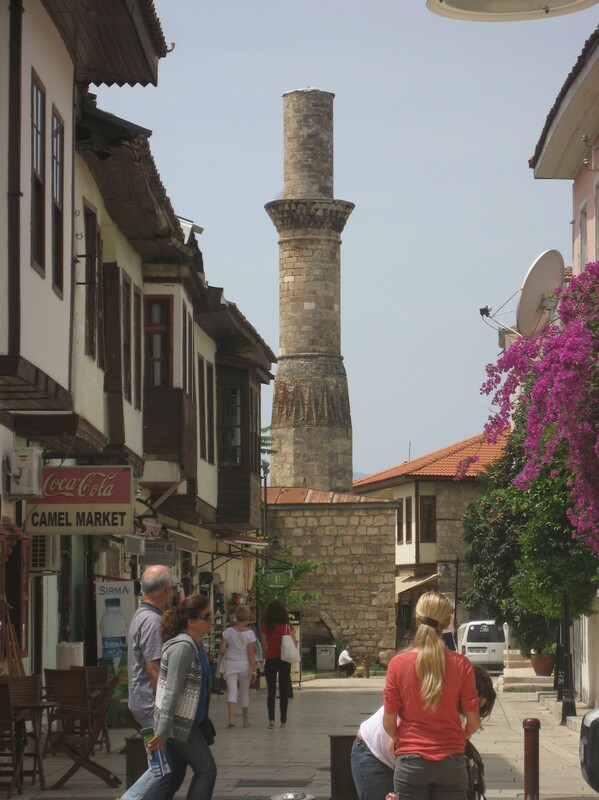 Below is the Mosque of the Truncated Minaret. It was once the city’s cathedral and was built in the 5th century AD. There is evidence that boat commerce was active on the Mediterranean by 4000 BC. 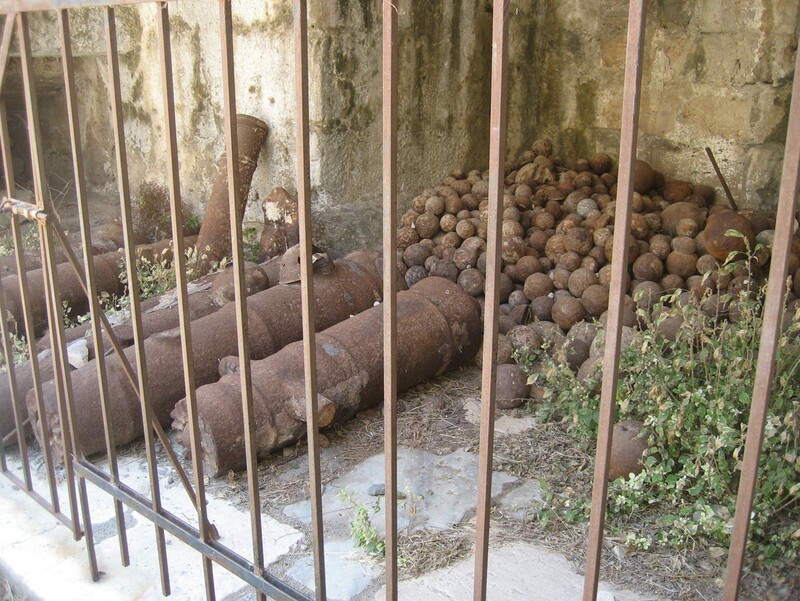 All of these coastal cities had fortified walls and castles to defend themselves. 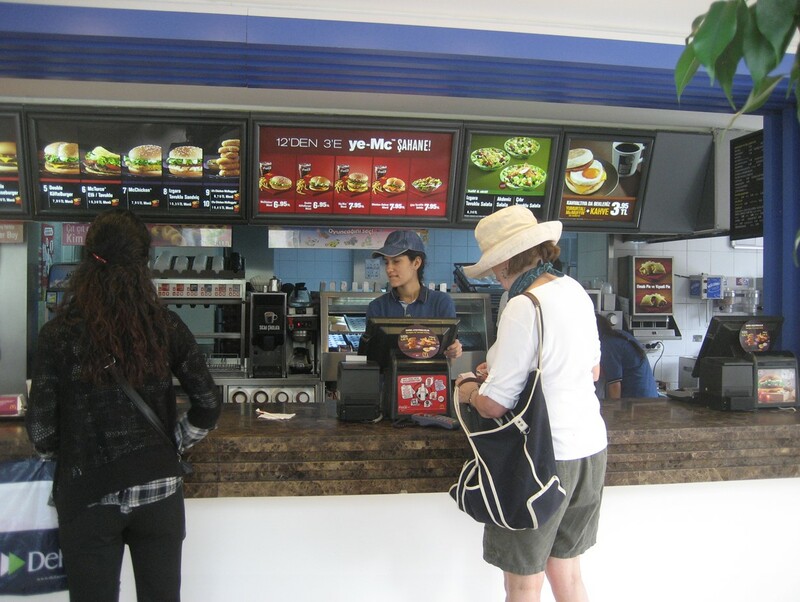 As in the United States, McDonald’s restaurants are ubiquitous throughout Turkey, even in Antalya Turkey’s Old Town. We just had to compare the quality of the chocolate milkshake. From the earliest hours of our visit to Turkey, we were confronted with the Muslim call to worship five times per day from loud speakers atop the minarets. 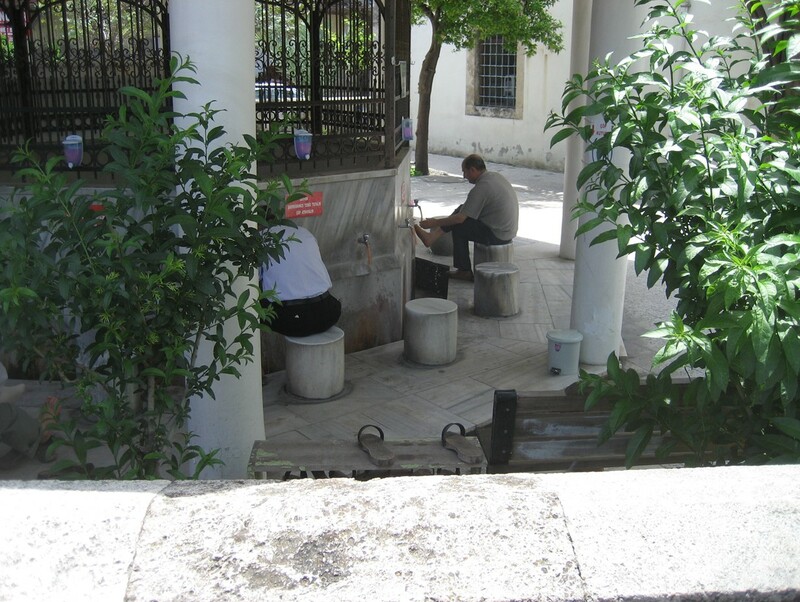 All of the Mosques have foot-washing facilities nearby for worshipers to cleanse themselves. We spent the morning swimming in the pool and then took a taxi back to the Antalya airport to rent a car for the next week. 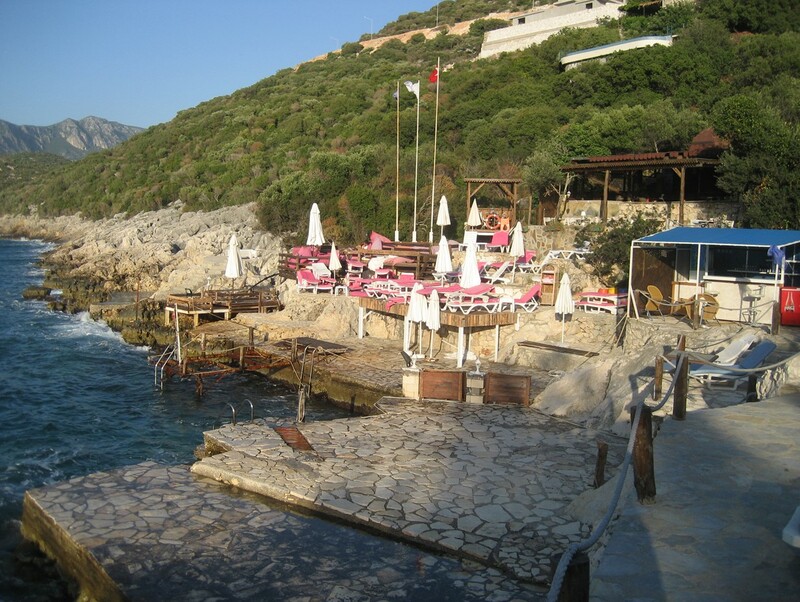 We drove for about 4 hours from Antalya to Kas (pronounced Kosh). 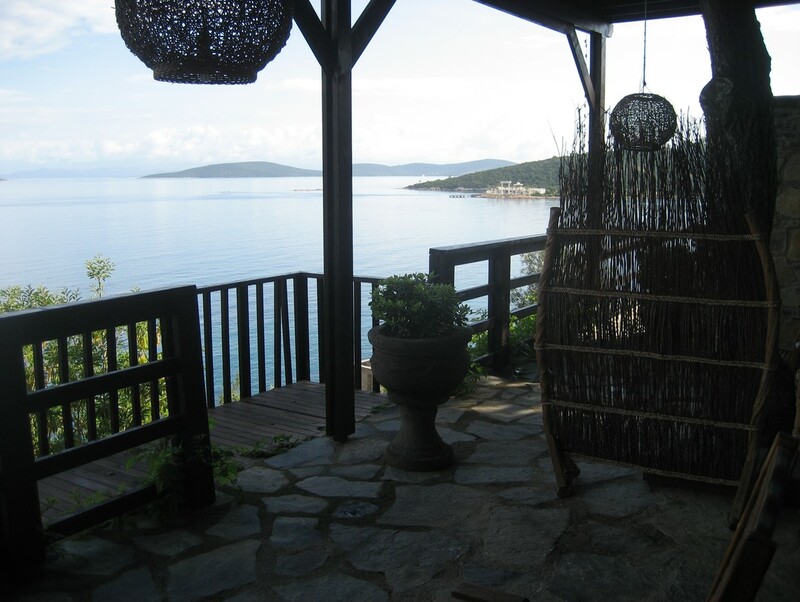 Kas is not very well known but was our principal destinations. 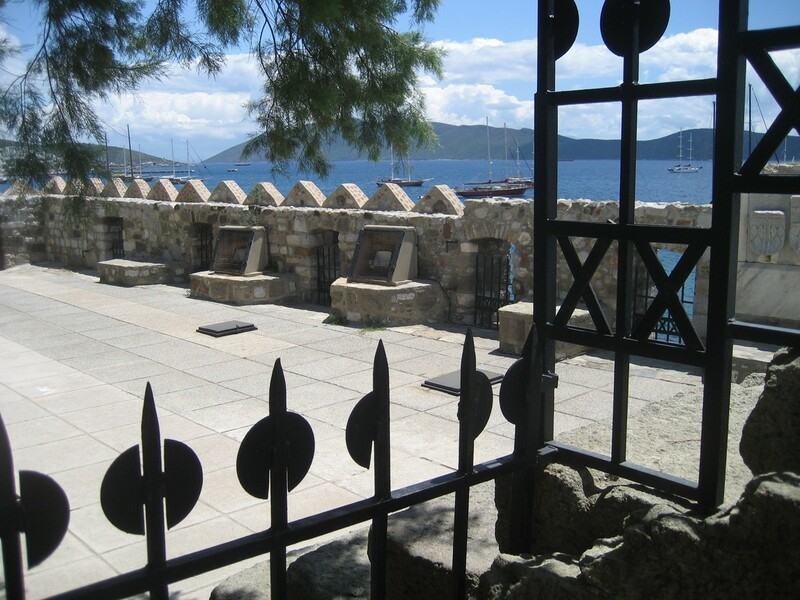 In his will, Thomas Fischer asked Pat to spread a portion of his cremated ashes at the amphitheater on the Kas peninsula. I have to say that the iPhone with its GPS mapping technology was indispensible during the driving portion of this trip. We always knew where we were and we quickly knew when we had made a wrong turn. 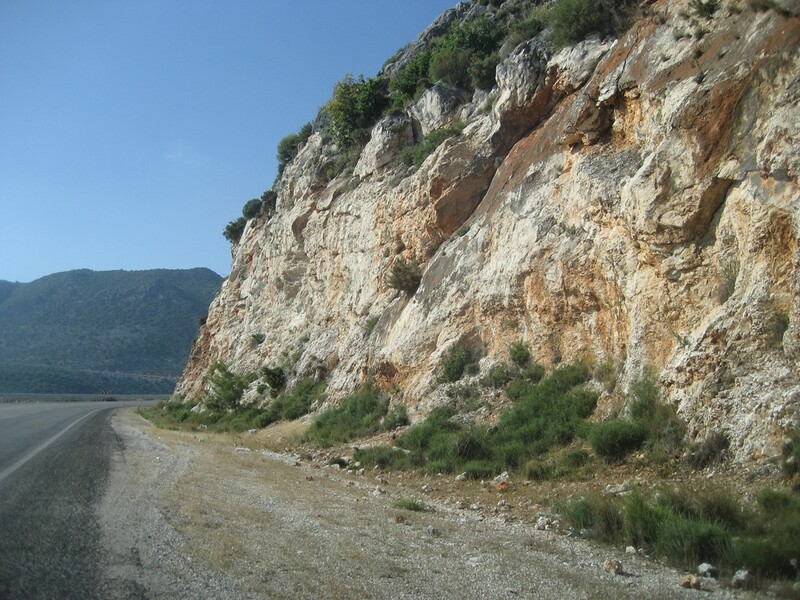 By and large the drive from Antalya to Kas followed the coastline of the Mediterranean. 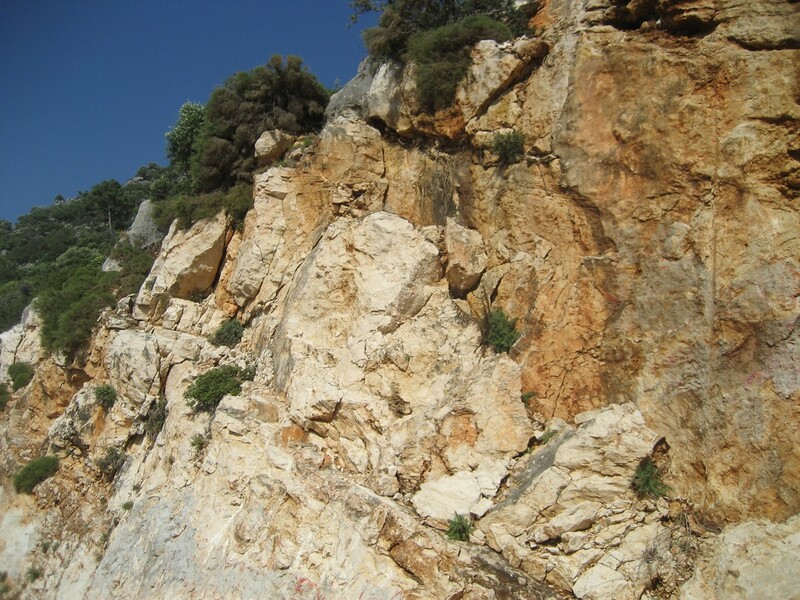 As such, the road was cut from the marble rock that makes up much of this part of Turkey. The drive is beautiful but can be a little hairy as the roads wind up into the mountains and back down. The hills are very steep and you can’t look down if you are afraid of heights. 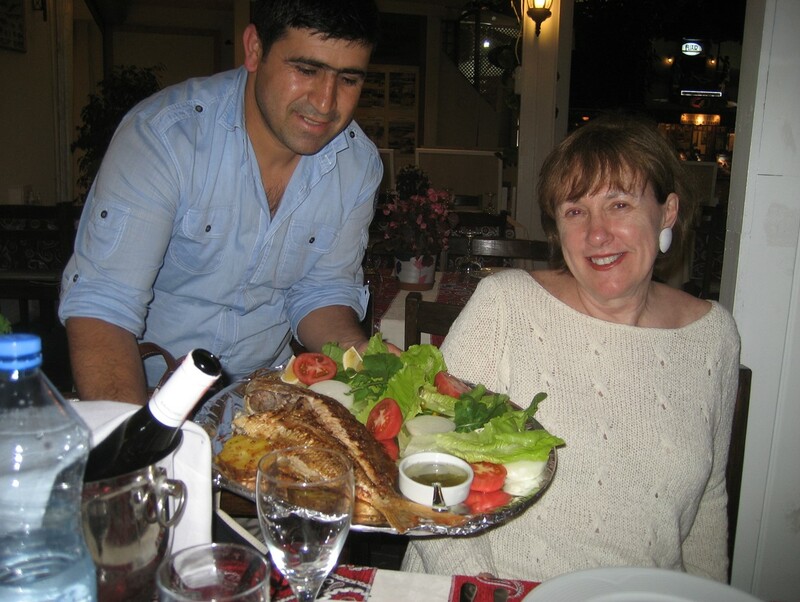 We found that tomatoes are an important part of the Turkish meal. Tomatoes were at least an option with every meal. 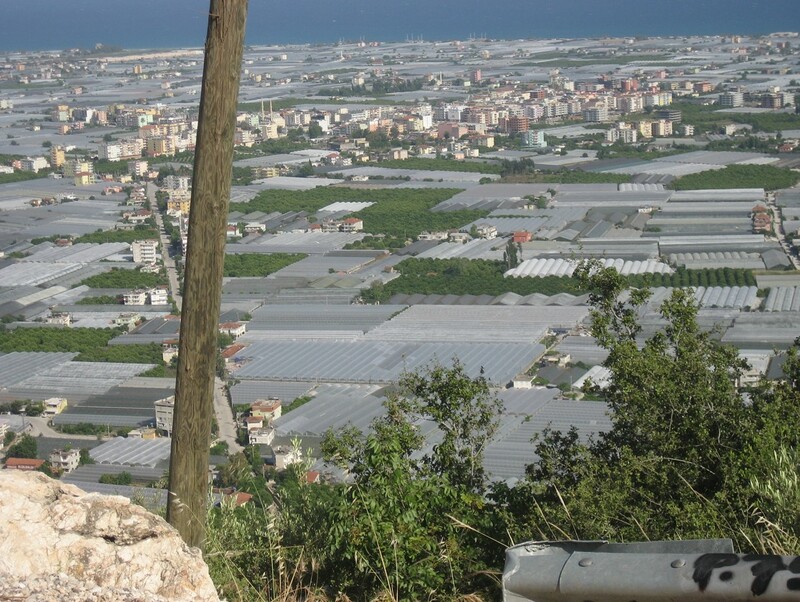 As a result, there are large areas the size of small cities that are covered with greenhouses where tomatoes are grown year round. Another driving hazard is the herds of sheep and goats. 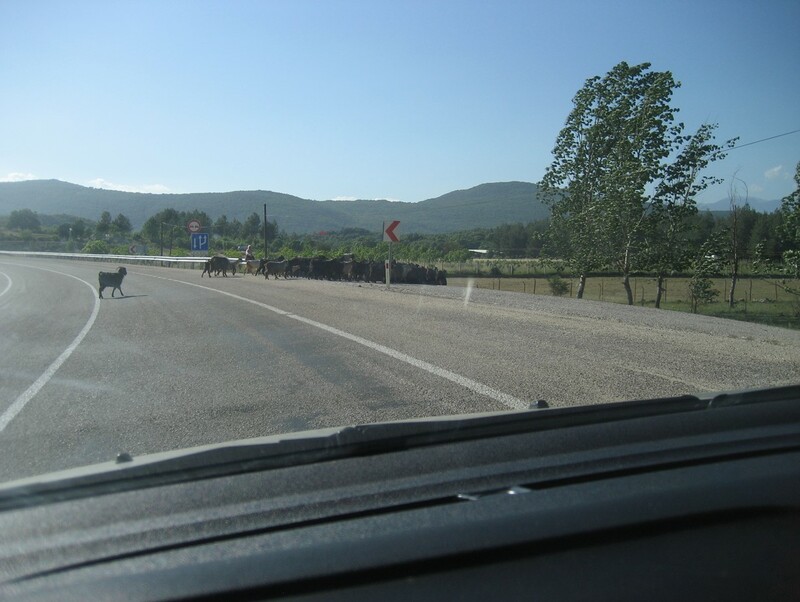 They are a staple of the Turkish diet and they have the right of way when crossing roads. 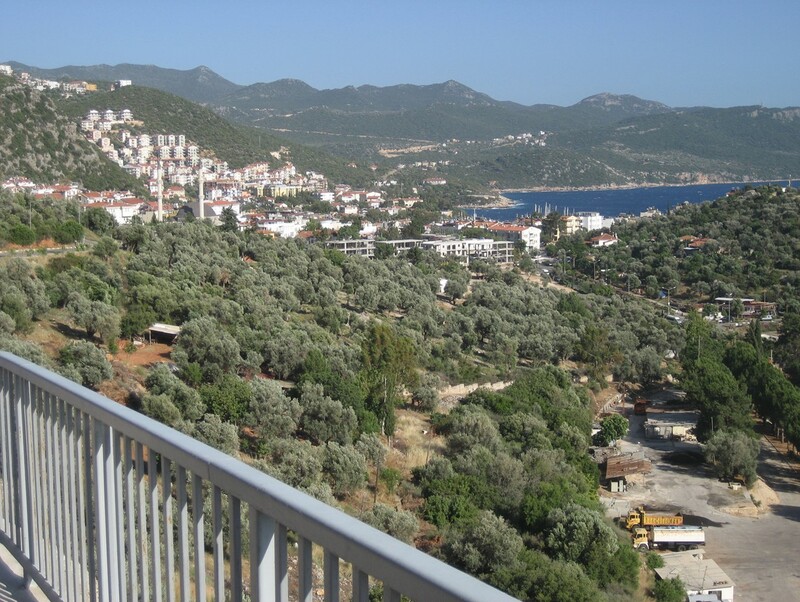 As we approached the city of Kas the view was just gorgeous. The iPhone GPS took us right to the door of what we thought was our hotel. Unfortunately, it took us to Hotel Phellos. When the staff looked at our confirmation letter they pointed out that our reservation was at Hotel Antiphellos. 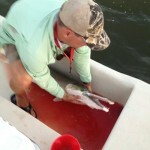 It was out on a peninsula about 10 minutes away. 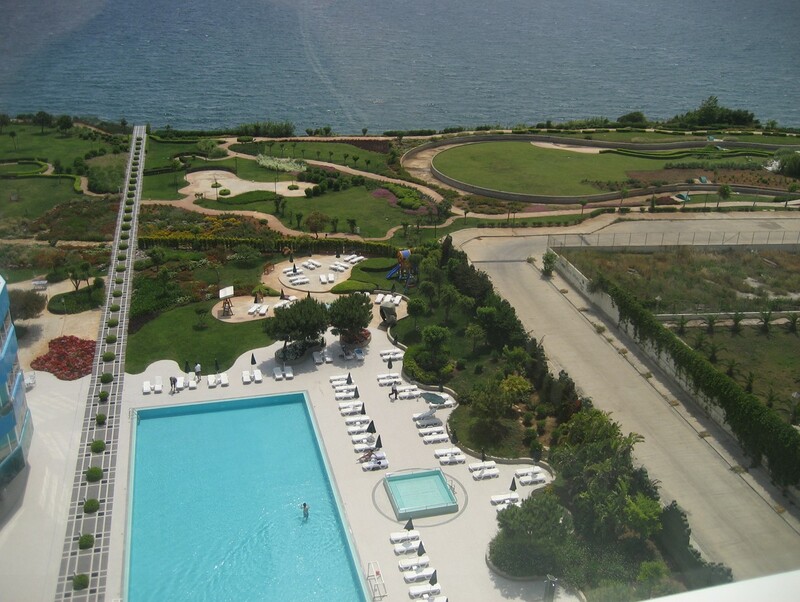 Contrary to our experience in Antalya, the outside of the hotel was quite cute but the room was terrible. We were glad we were only staying one night. When we asked about the beach and the opportunity to swim, they pointed us to a long winding path. Pat was still thinking she might get in a swim. It was not to be. This just wasn’t going to work. We made our way driving back into town intending to stop and spread Thomas’s ashes at the amphitheater before continuing on to dinner. Unfortunately, we found what seemed like the entire town turned out for a flute concert at the amphitheater. We could hardly get our car through the crowd, let alone find a parking place. Spreading the ashes in a crowd was out of the question. 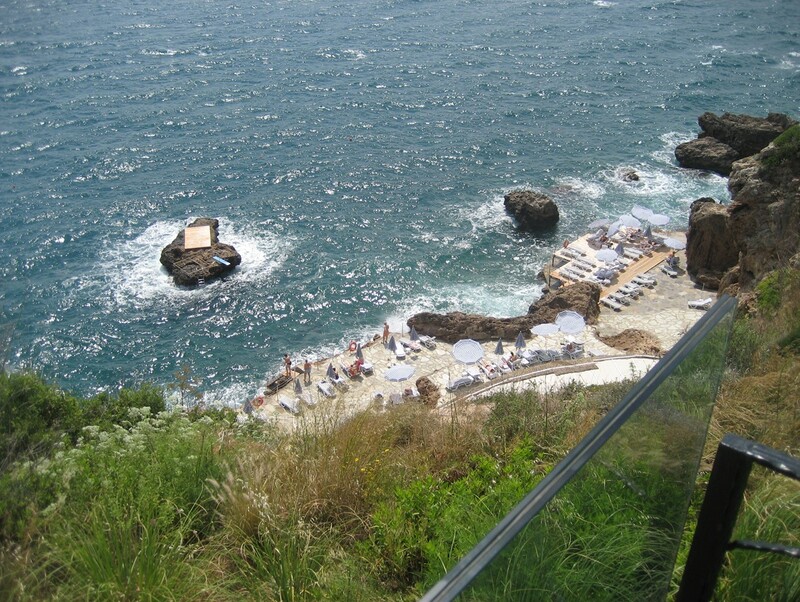 We decided to go into Kas and have dinner and spread the ashes in the morning. We grabbed a quick breakfast at the hotel, packed up the car and left the hotel. 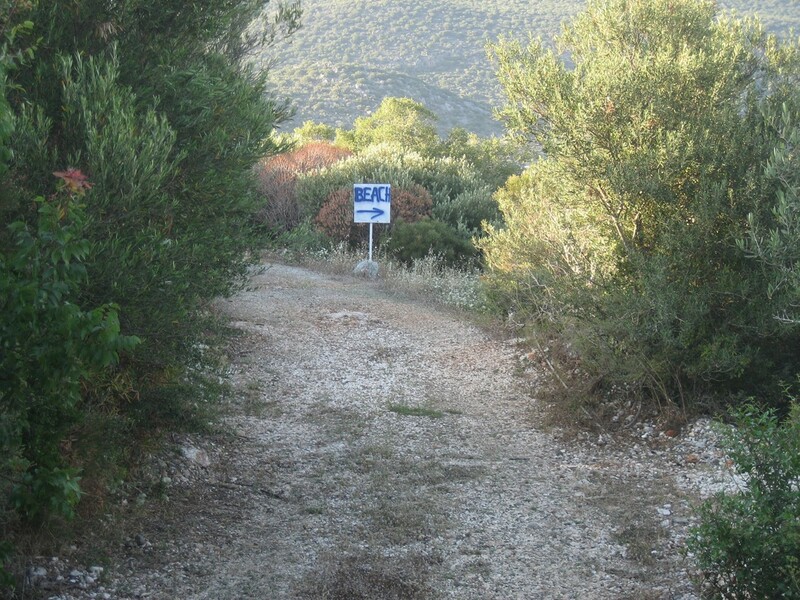 The amphitheater is about ¾ of the way along the peninsula as we returned to Kas. This time there was only a small cleanup crew and we were able to accomplish our mission. It was hard to imagine the crowd that had descended on this small theater the night before. Then it was back in the car for the 4-hour drive to Bodrum. Along the way Pat was reading the travel guides and we made a few interesting stops. 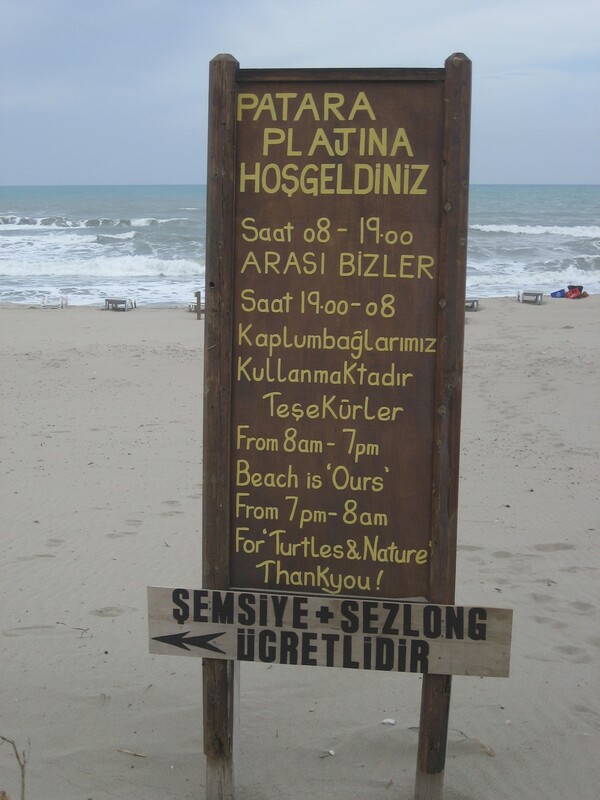 One was at Patara Beach. 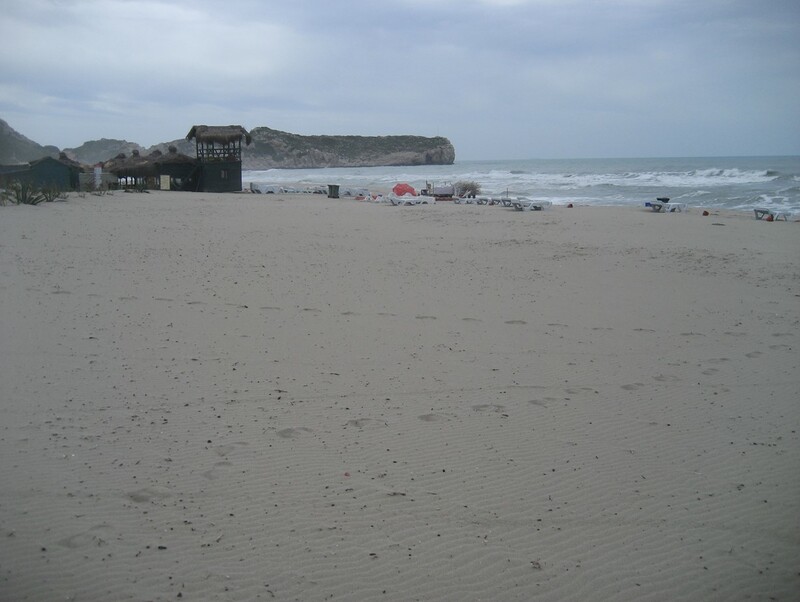 This is a wide expanse of beach that has filled in over the centuries to move what was once a seaside town back inland. It is now carefully preserved for the sea turtles. 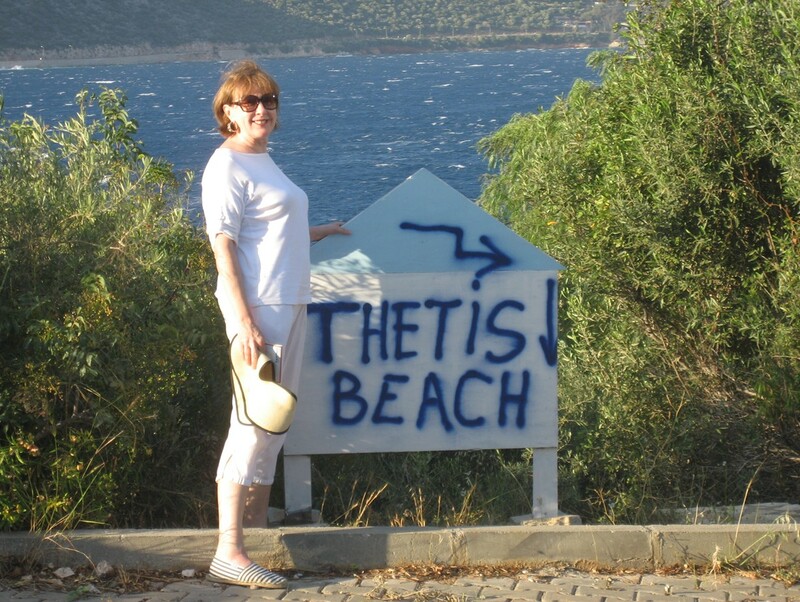 As the sign says: ‘People get the beach during the day and the turtles get it at night’. Again we drove for a while and came upon some more ruins. 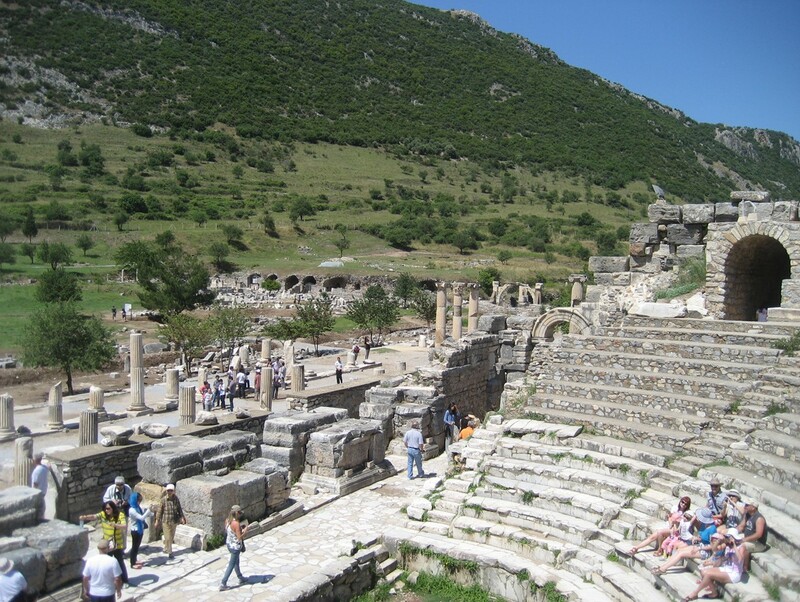 This was the partially restored Lycian League where the senate met and resolved issues of the day. Even as we drove out back to the highway we could see ancient columns sticking out of the ground that had not been restored. 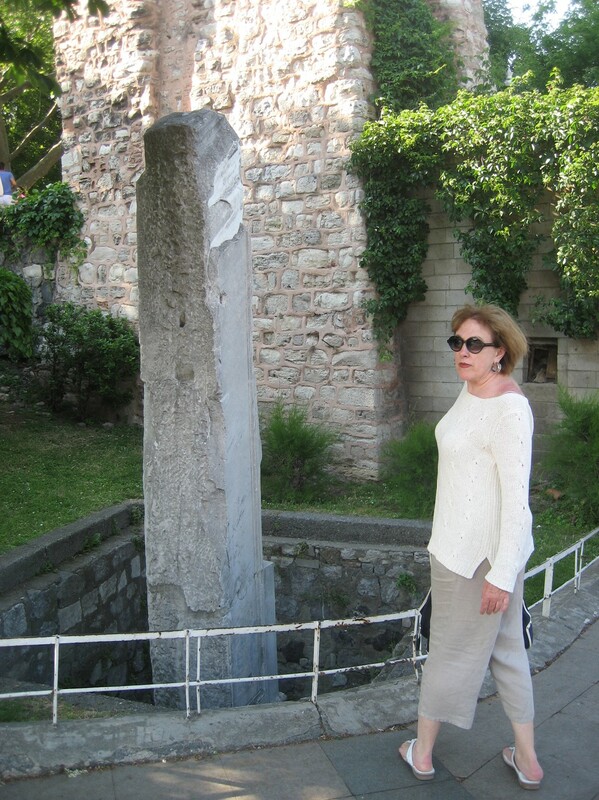 There is so much history in Turkey. At long last we arrived at Bodrum and again the iPhone GPS took us right to the hotel. We believe that for the first two nights we were the only guests at the Sedative Hotel and Spa. The facility was beautiful to look at but not so practical to live in and navigate. The stairs were all stone but you couldn’t get from our room to the restaurant or the spa without either going up and back down 3 flights to administration or crossing in front of numerous other guests’ balconies. Again, the room was beautiful to look at but somewhat impractical. It was on three different levels. The mid level had a large hot tub we never used. There were no railings on the platforms and we were worried about wandering around in the dark. There were no bedside tables. The only lights were part of the overhead fans. The hot water came in waves – really hot then really cold. We were here for six days and really enjoyed our stay. We just got used to the unusual design elements. The first night we again decided to eat dinner at the resort. We were the only guests and the maitre’d provided no menu. He was very nice and we came to enjoy discussions with him but he basically said, ‘What would you like’? 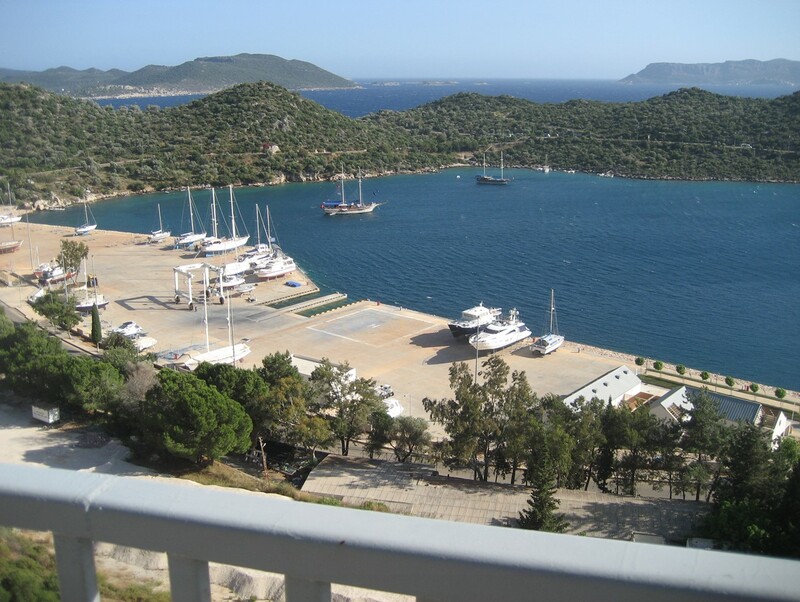 Bodrum is on the Aegean Sea and below was the view from our balcony. 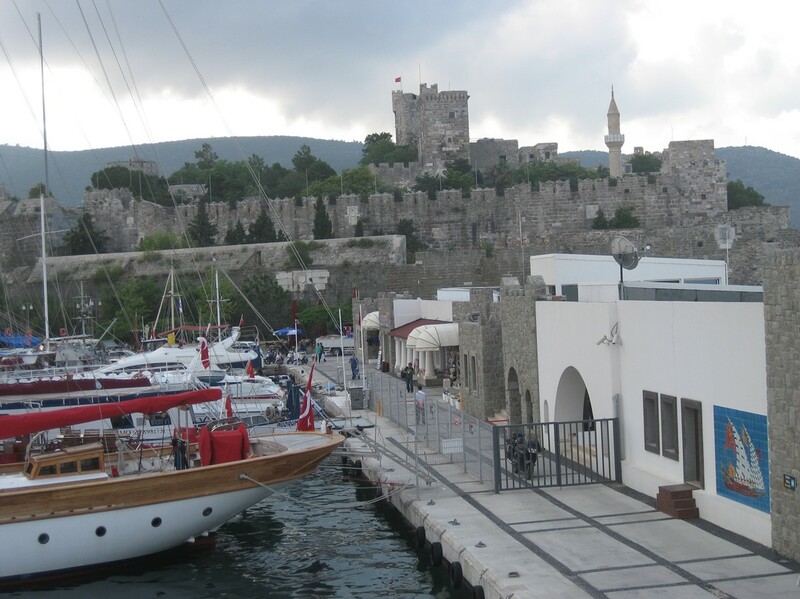 The city of Bodrum is a very busy port. There were thousands of luxury yachts, ferryboats and tour boats in the harbor. 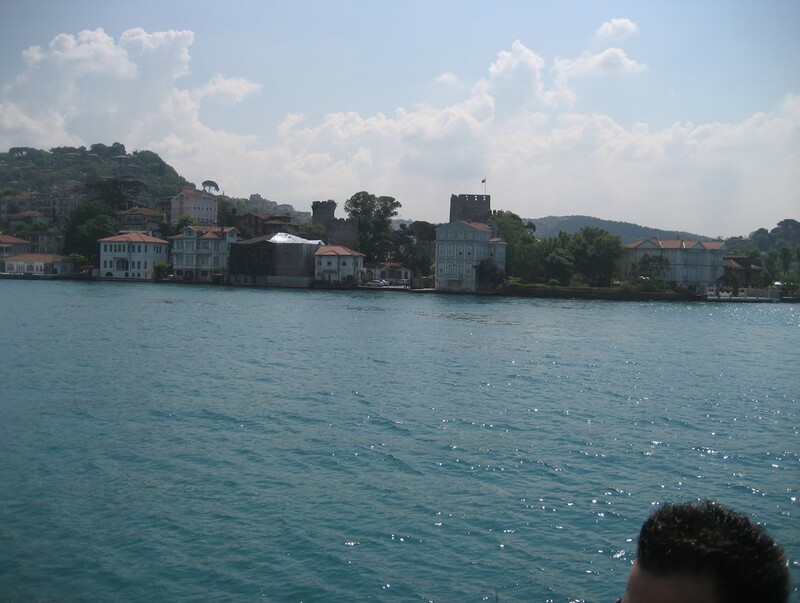 As with many port cities in Turkey, this one was once guarded by a castle. 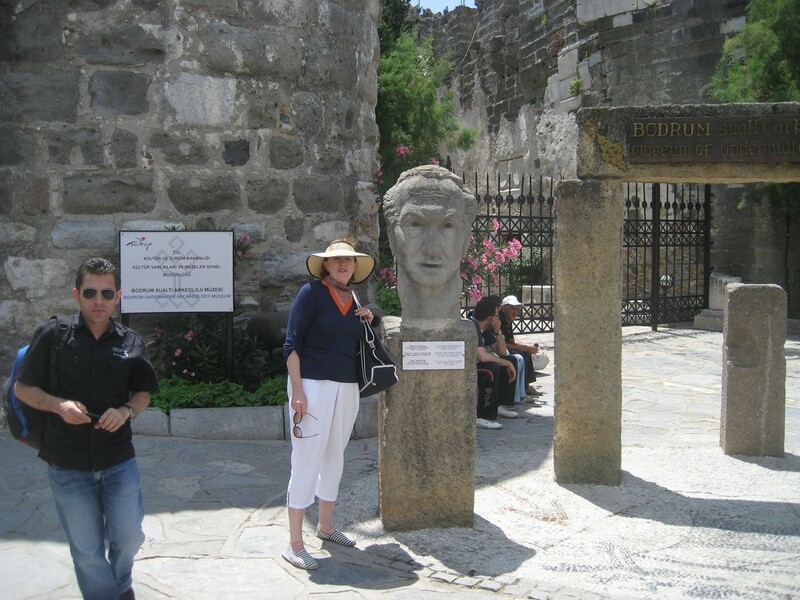 This castle is now the Bodrum Underwater Archeological Museum. 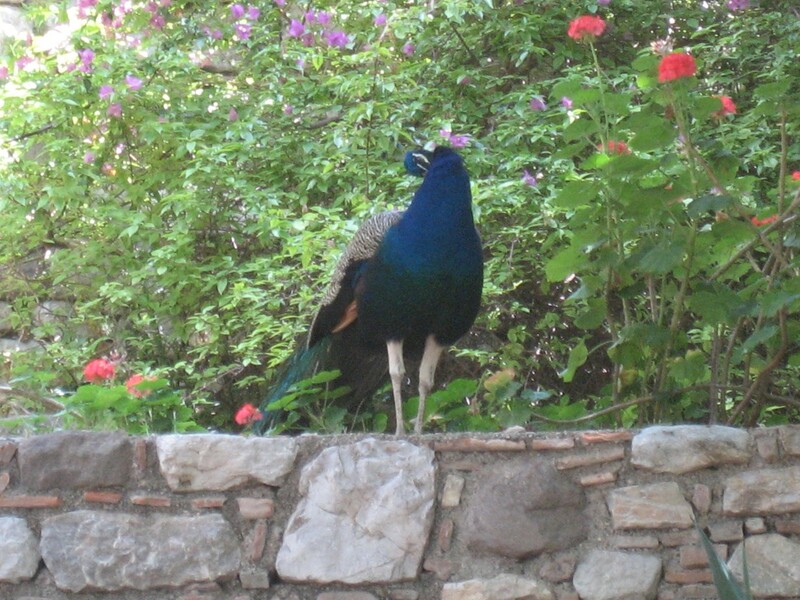 This peacock had setup housekeeping inside the castle walls and very loudly made its presence known. 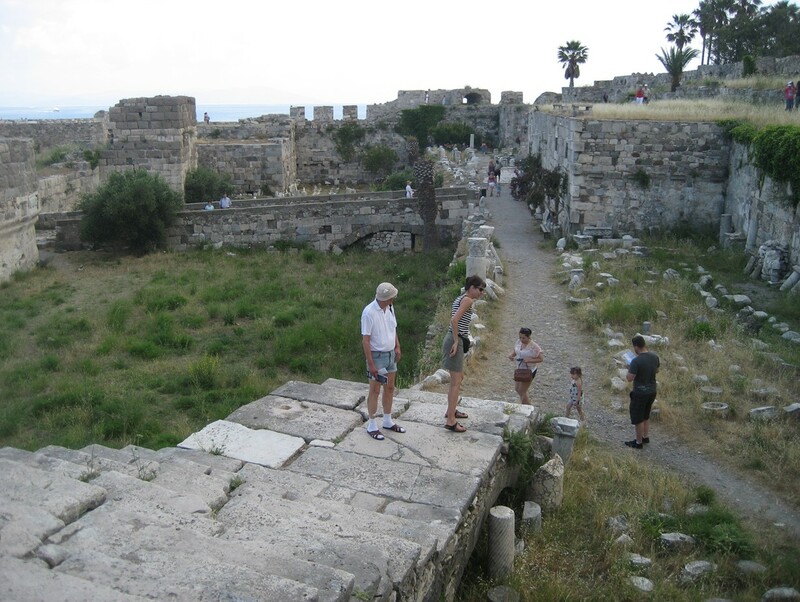 The construction of the Bodrum Castle was begun in 1406 by the knights of Saint John and was built on top of the old Turkish and Byzantine castles under the name of Saint Peter. The construction continued until 1522. 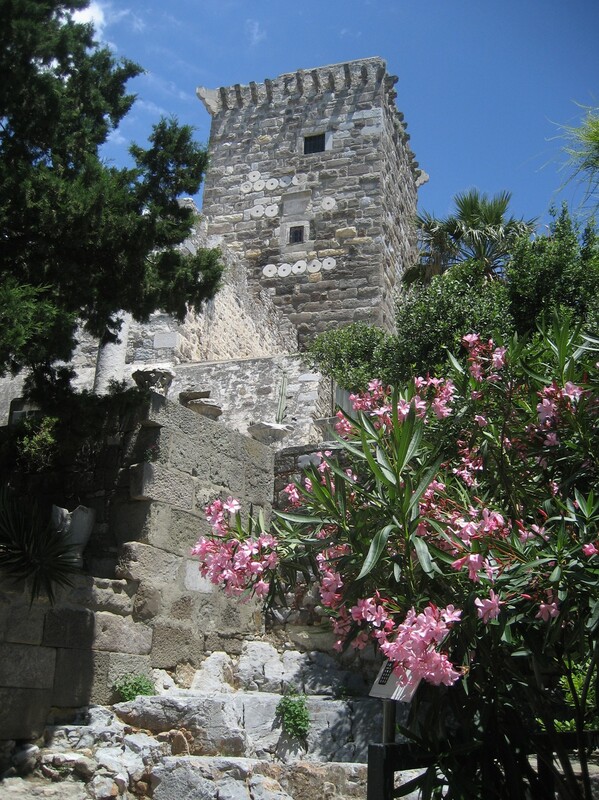 It is the strongest castle in the Mediterranean. In order to reach the inner castle, one passes through seven gates. There are five major towers in the castle, each built by different nations. There are 249 coats of arms on the walls. 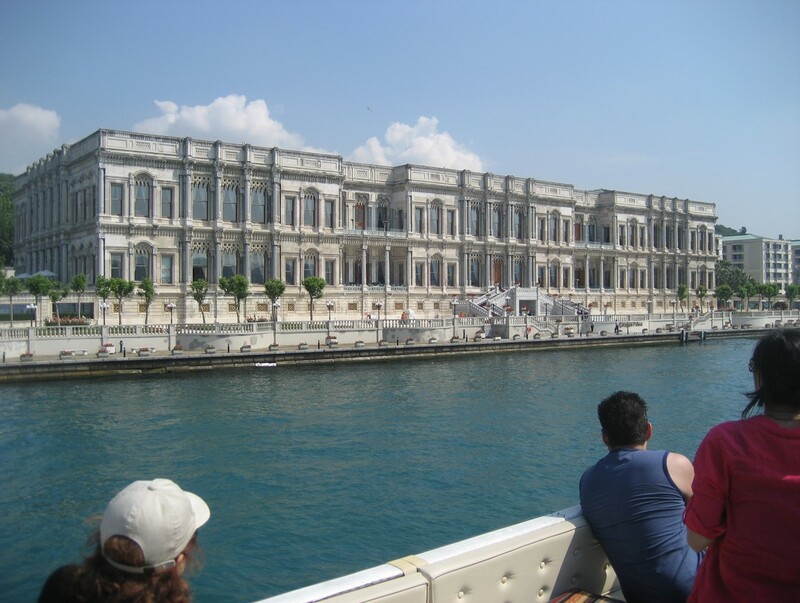 This museum is the biggest underwater archaeology museum in the world and the only one in Turkey. 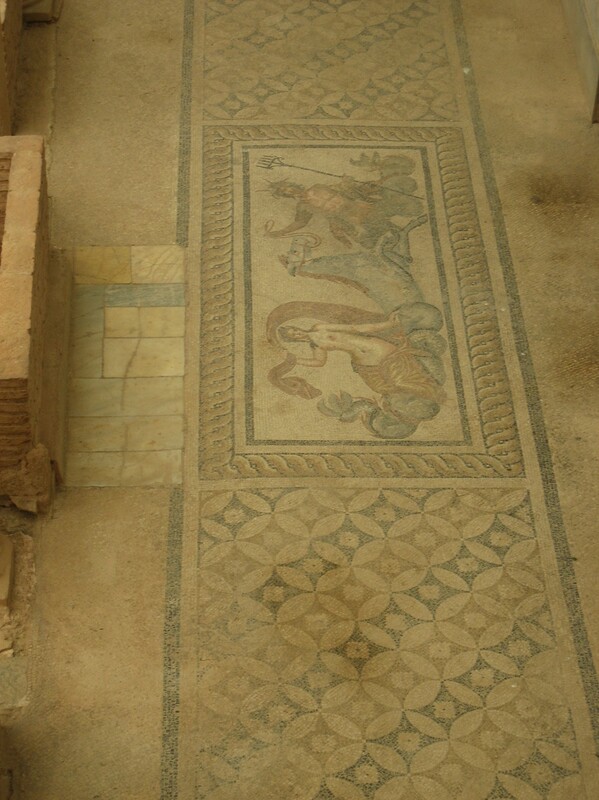 Excavations include the Uluburun shipwreck from the 14th century B.C., the Finike-Gelidonya shipwreck from the 12th century B.C., the Bodrum-Yassiada Byzantine shipwreck from the 7th century A.D. and about 5 others from similar periods. When the Uluburun sank it carried 20 tons of raw materials; ingots of copper, tin and glass, ebony logs, amphora’s of resin, elephant and hippopotamus ivory, ostrich eggshells and food stuffs including Near Eastern spices. It also carried valuables fit for a king. 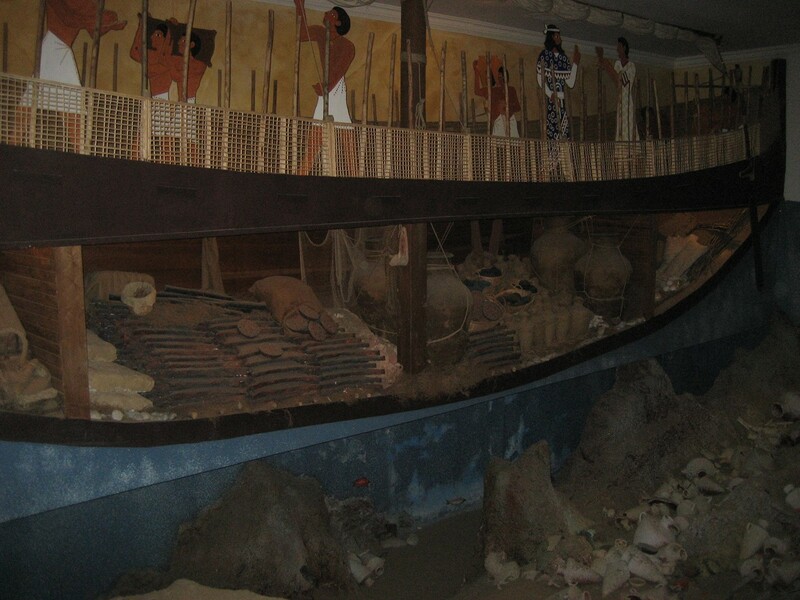 Below is an exhibit showing how the ship might have looked as it sailed. 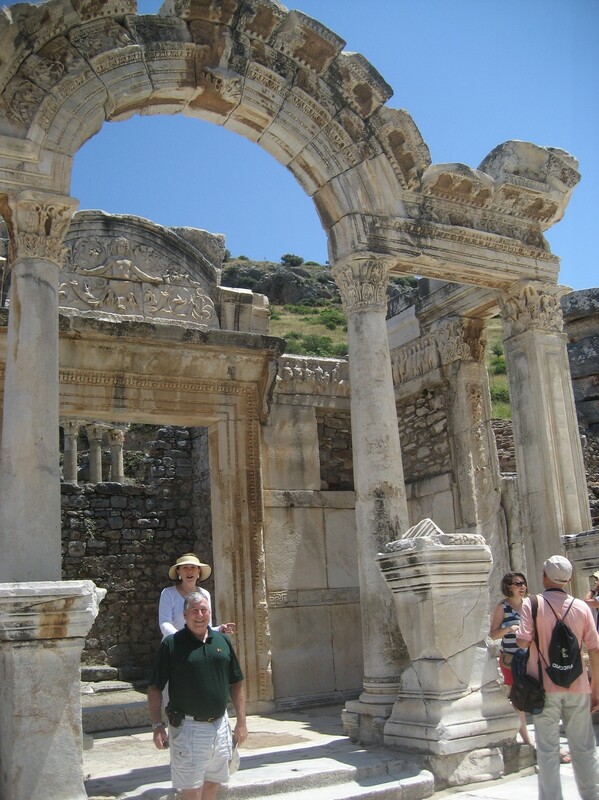 This day we hired a personal tour guide to take us to the old city of Ephesus, about a two-hour drive from Bodrum. 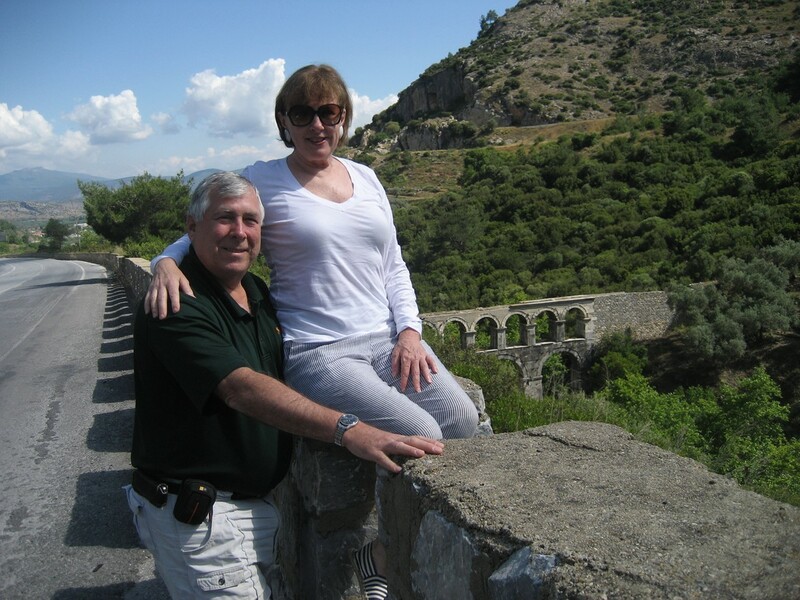 During the drive we stopped so our guide could show us part of a Roman aqueduct that still stands. 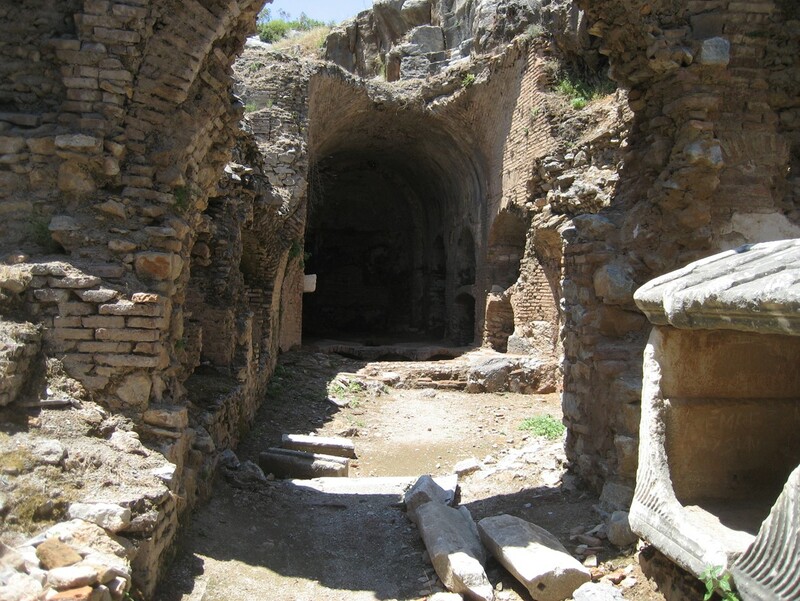 This would have been built to carry fresh water to the city of Ephesus. 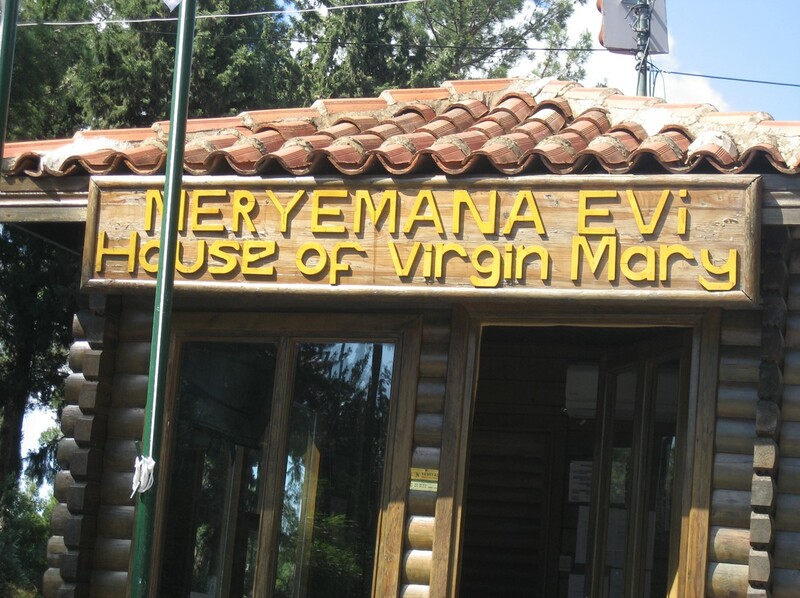 When we arrived at Ephesus we first went up the hill to visit what many people believe to be the last house of the Virgin Mary. Several Popes have visited the site lending some credence to the belief. 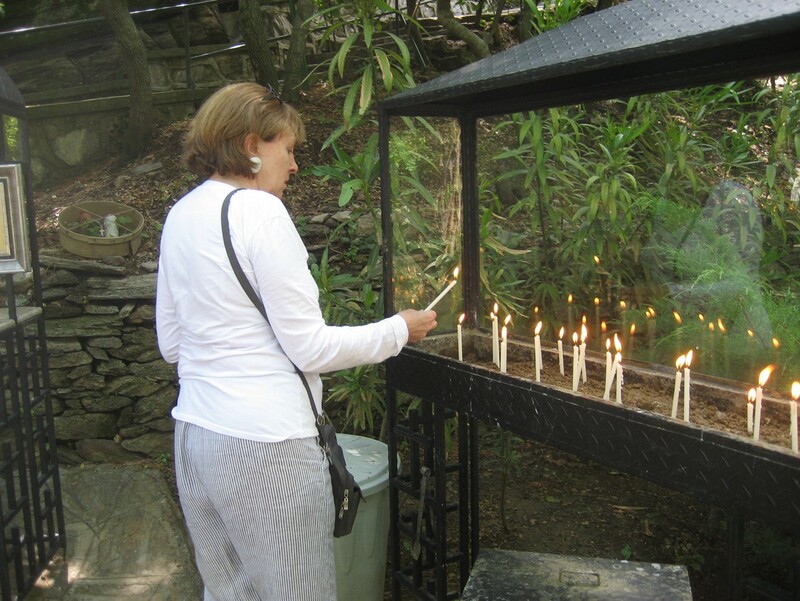 The house itself has been rebuilt several times upon the original foundation which has been dated to approximately 1 A.D.
Below, Pat lit two candles in remembrance. 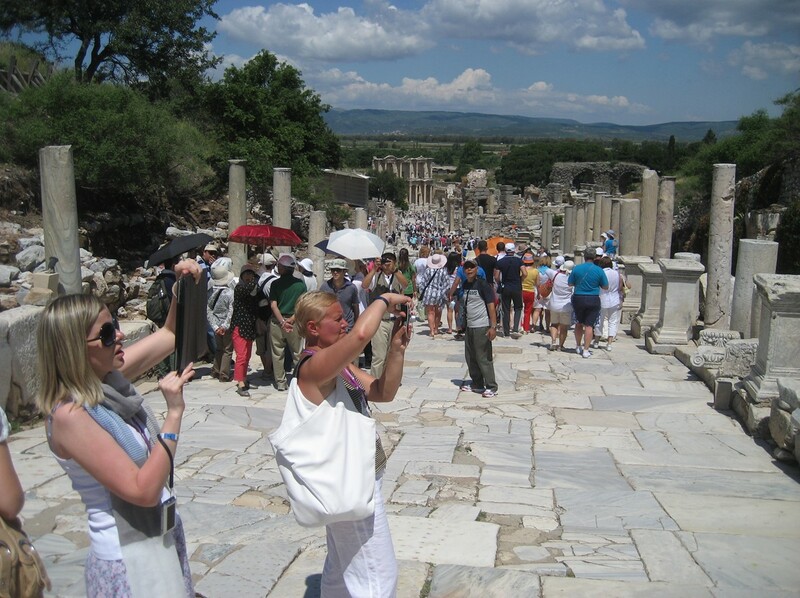 We then went back down the hill to visit Ephesus. 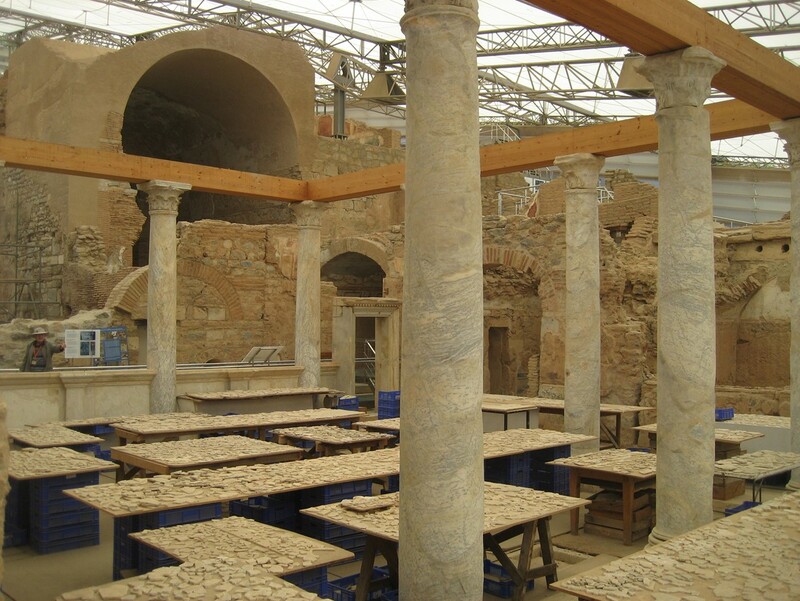 The foundation history of Ephesus goes back to Neolithic Ages (6000 B.C.). Excavations and research have revealed settlements from the Bronze Age. The city used to be a port city but silt and sediment have moved the water well back from the current location. 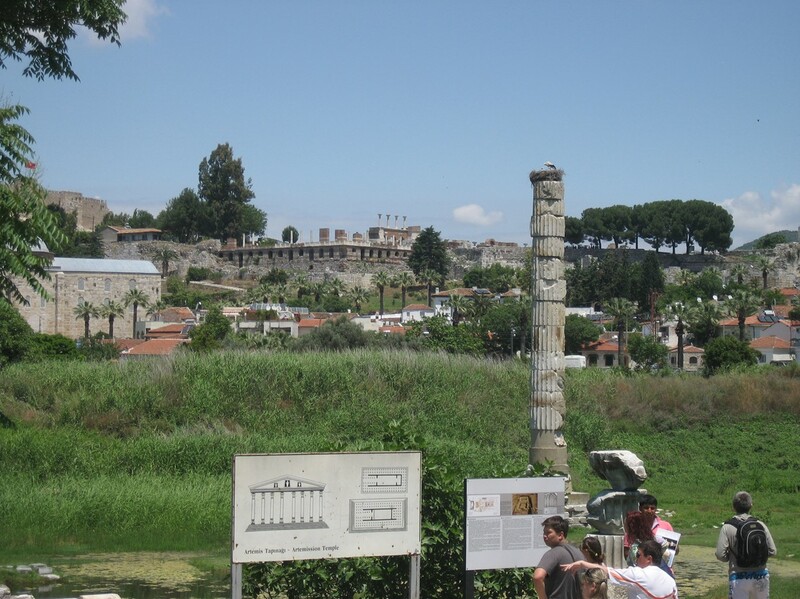 The city we are able to visit today was founded around 300 B.C. 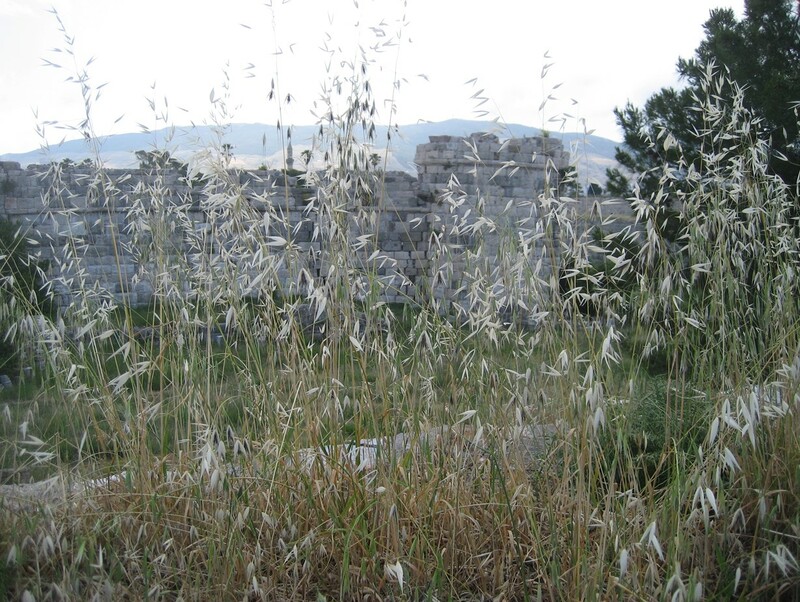 by Lysimakhos who was one of the generals of Alexander the Great. During its heydays the city had a population of 200,000 as the capital and largest port city of the Roman Province of Asia. As we started our walk we were impressed with the age and quality of the city. 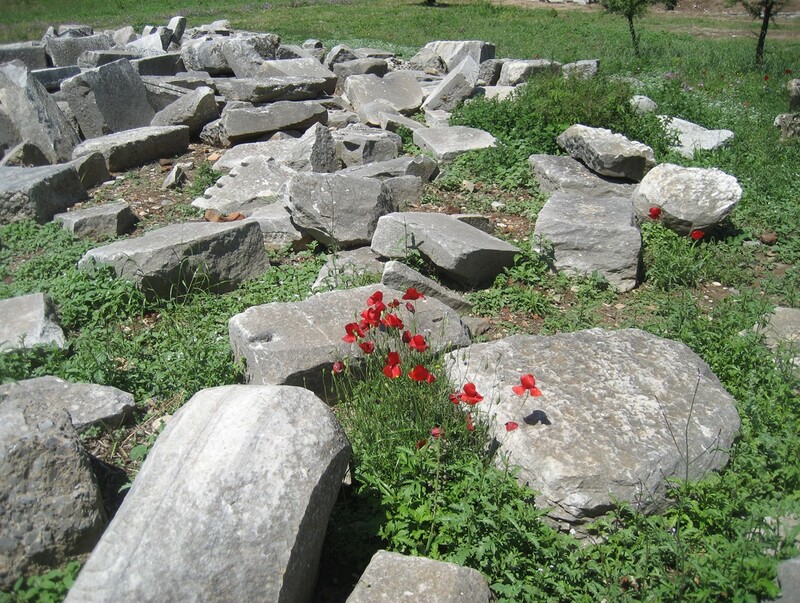 Poppy flowers were in full bloom among the stones. Around each corner, a new aspect of the city emerged. It just kept growing and unfolding. Below are examples of three different styles of capitals atop the columns. 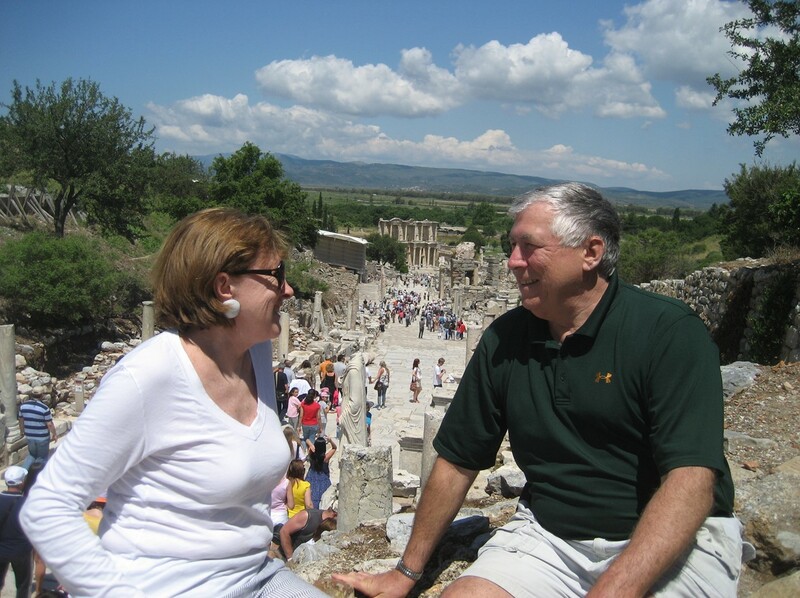 This was not even the main street of Ephesus. There was a small gateway just to our left through which people went from the more residential area to the more commercial area. We were not alone and were glad we were not touring during the vacation season. 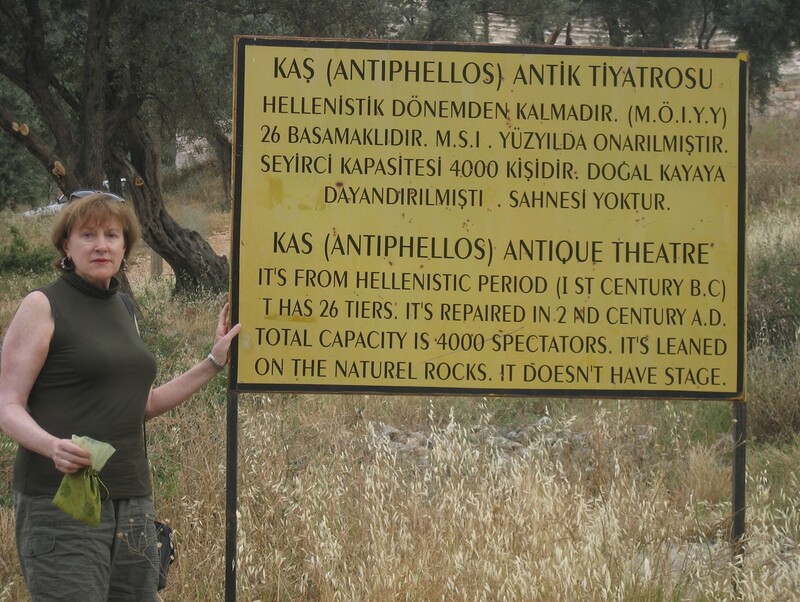 Below is an active archeological site at Ephesus. It is completely covered to protect the workers and the artifacts they are working on. 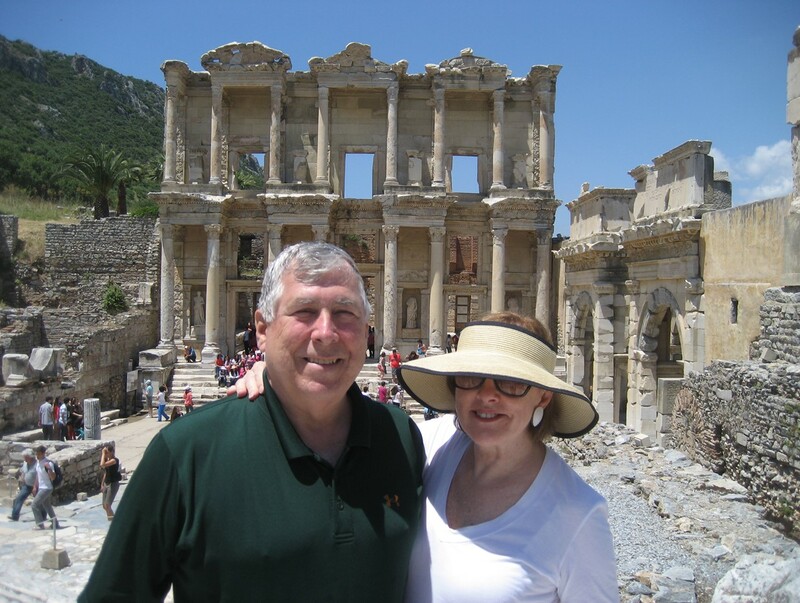 They believe this was the residence of one of the highest ranking officials of Ephesus. This house had running fresh water. 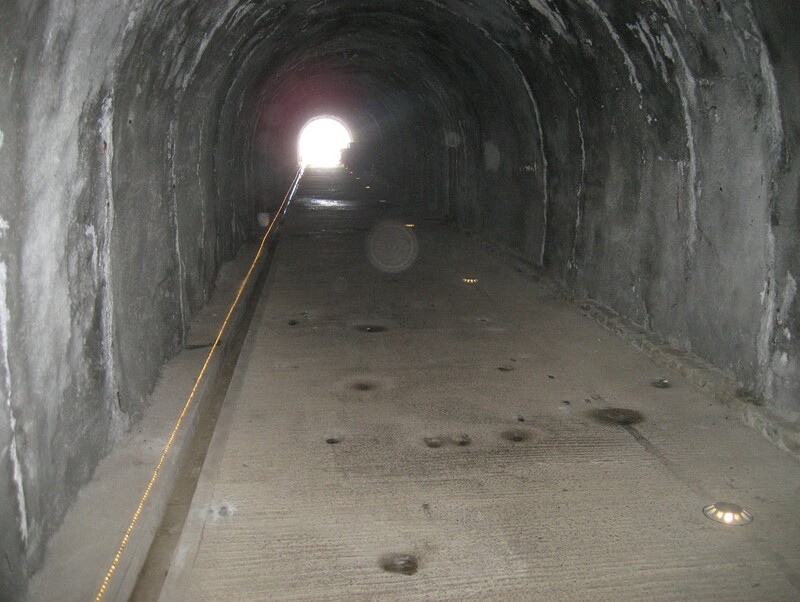 Waste was carried away through a sewer system. Various tiles were laid out on the tables like puzzle pieces as they tried to reassemble them. Our guide pointed out fully three layers of plaster decorating the walls. Over the years the site has been hit with three severe earthquakes that did substantial damage to the property. New layers of plaster with different designs were added when the building was rebuilt after each quake. 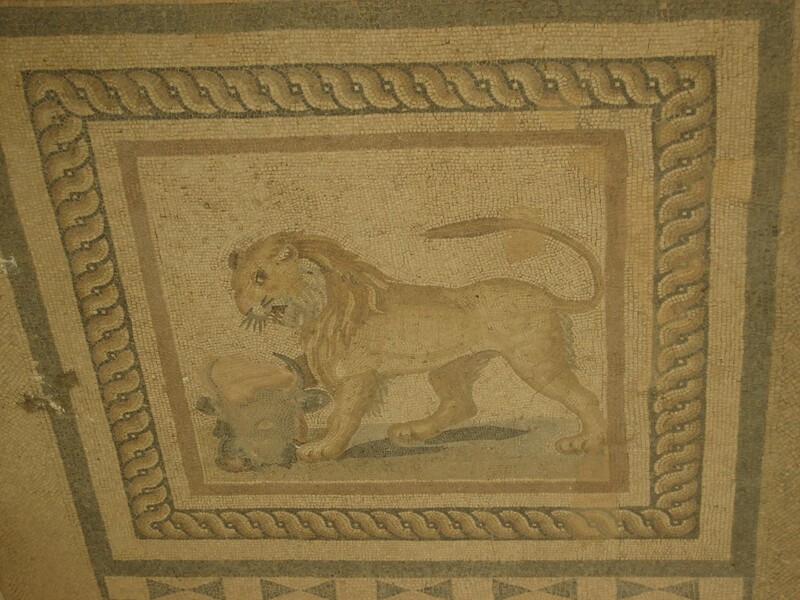 Below is a mosaic tile floor with a lion pictured. As the city continued to unfold for us, we came to the library. Our guide led us to believe that the symbols below point the way to a local brothel in the city. Allegedly there was an underground passage from the library to the brothel. While the women shopped, the men would go to the library and use the passage to visit the brothel. 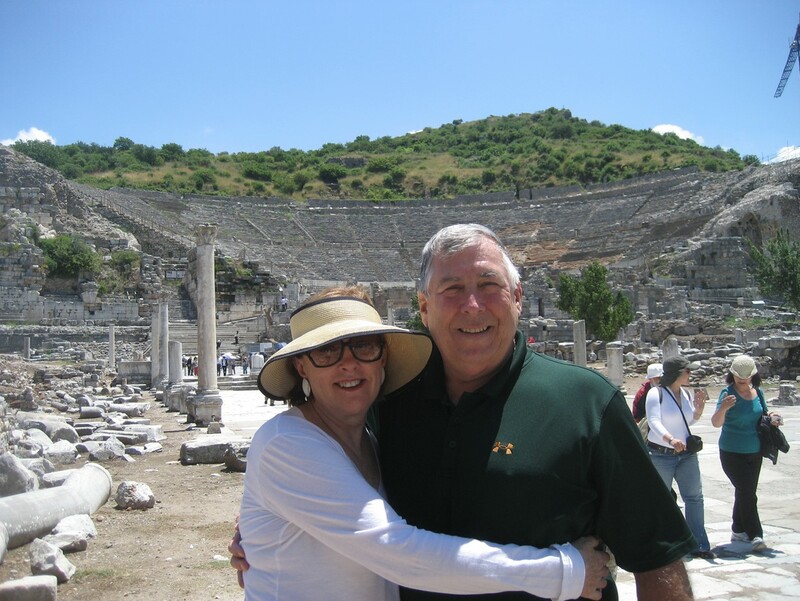 We concluded our tour and left Ephesus. We made a brief stop at the cave of the Seven Sleepers. The story says these seven men went to sleep for 200years. 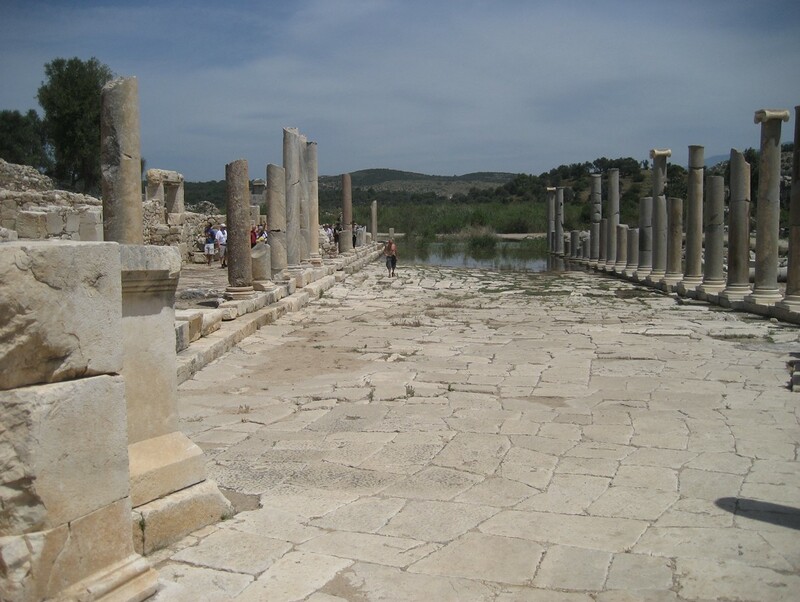 When they returned to Ephesus they brought coins that were many years outdated and thus the legend grew. We then made the mandatory stop at a rug center. 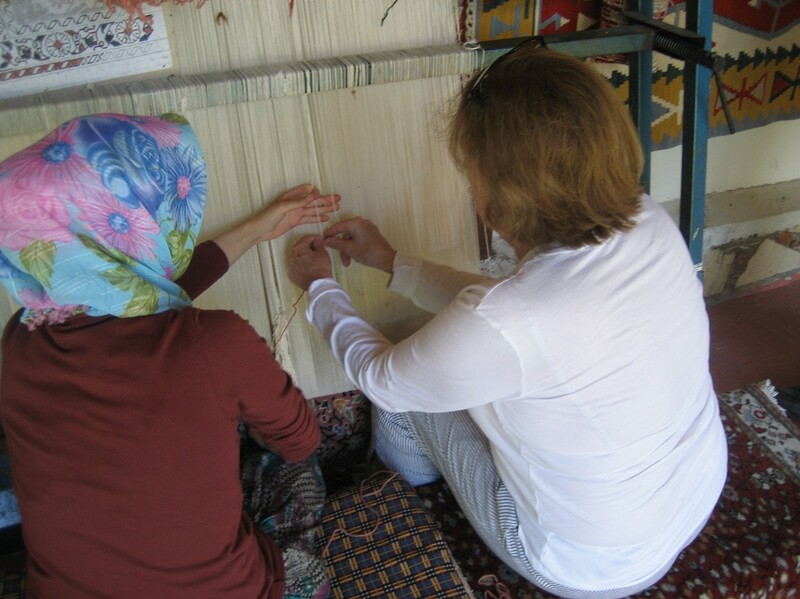 They demonstrated how the yarn is made and allowed Pat to weave a line in a rug under construction. 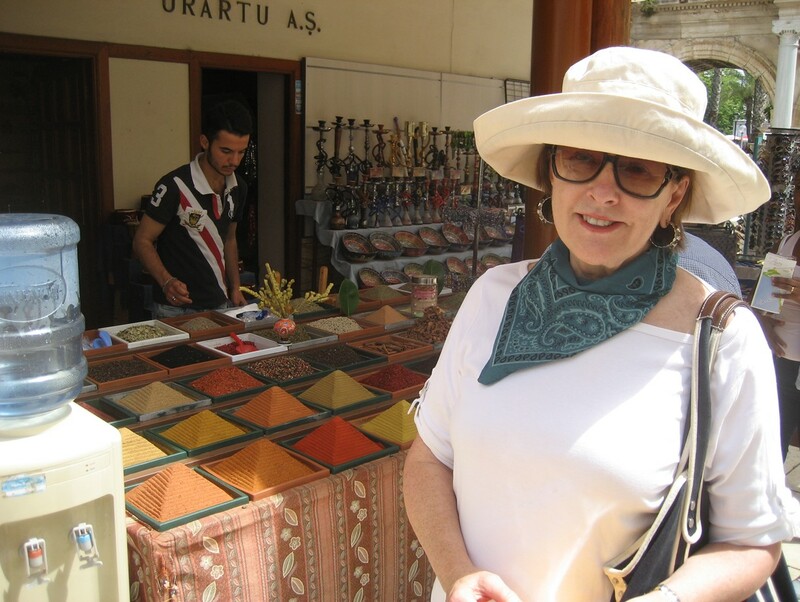 We enjoyed lunch at the rug store and continued our drive back to Bodrum. We stopped briefly at the Efes Museum but by now we were getting tired. 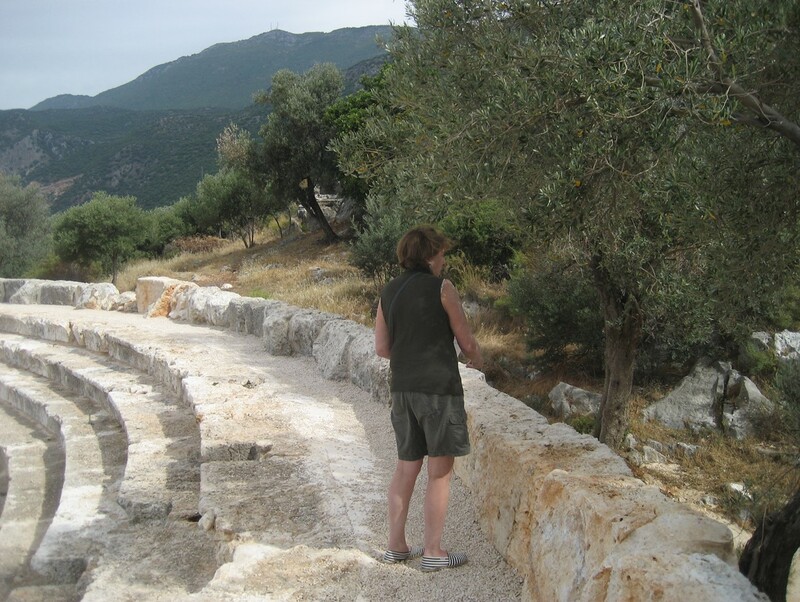 We did make one more stop at the Euromos ruins. 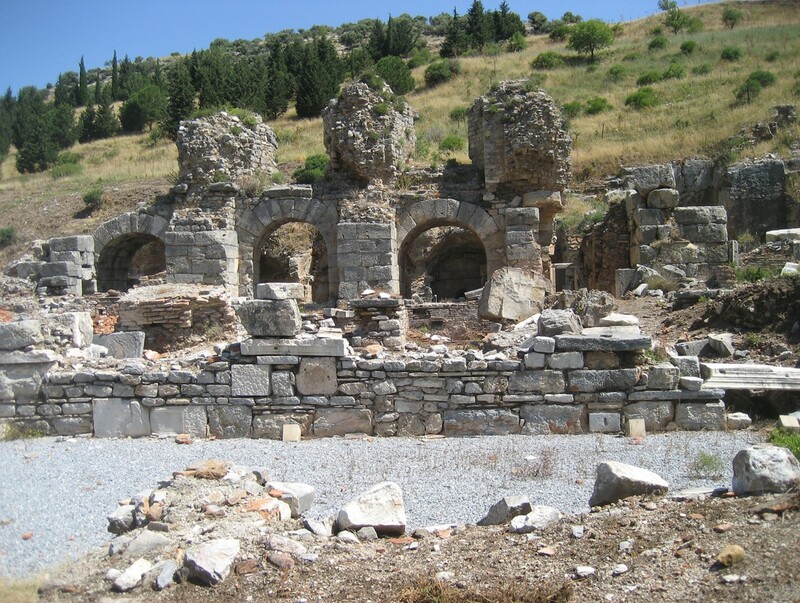 Euromos was one of the most important cities in ancient times. 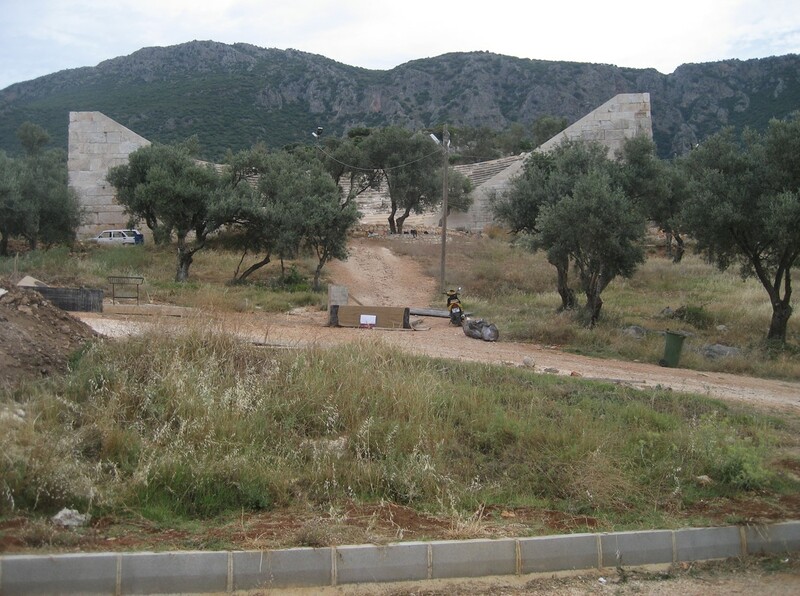 Below is the temple of Zeus. It was built by the Corinthian order and dates from the second century A.D. 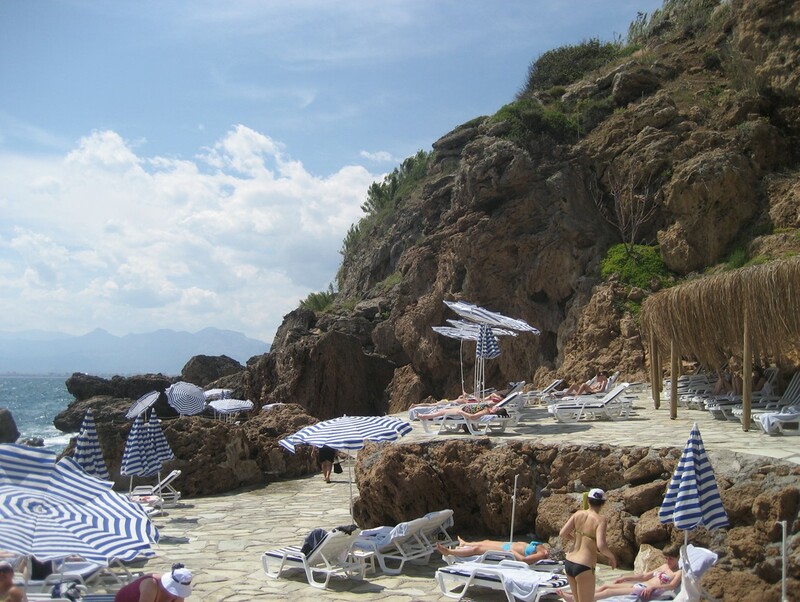 These two days we spent on two different beaches in and around Bodrum. The water was cold and salty but crystal clear and we swam without hesitation. This was our last full day in Bodrum and we decided to take the ferryboat to the Greek island of Kos. 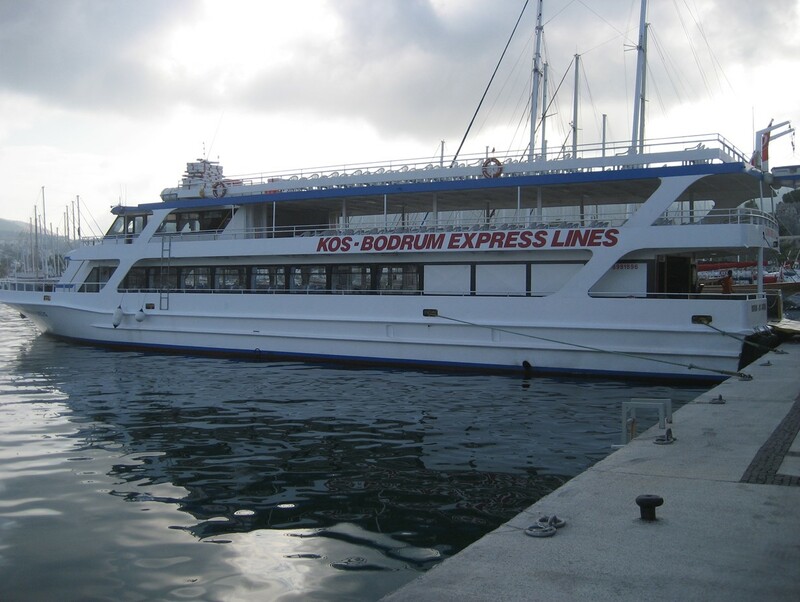 This was an all-day journey as the boat left Bodrum at 9:30 am and didn’t leave Kos to return until 4:30 pm. 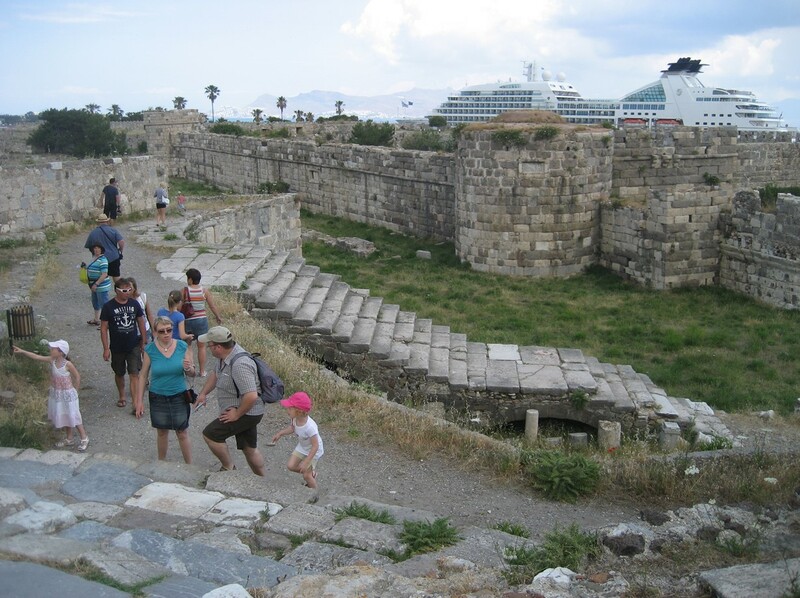 Greece is a separate sovereign nation which meant passport control leaving Turkey; Passport control upon arrival in Kos; Passport control departing Kos; and Passport control arriving back in Bodrum. 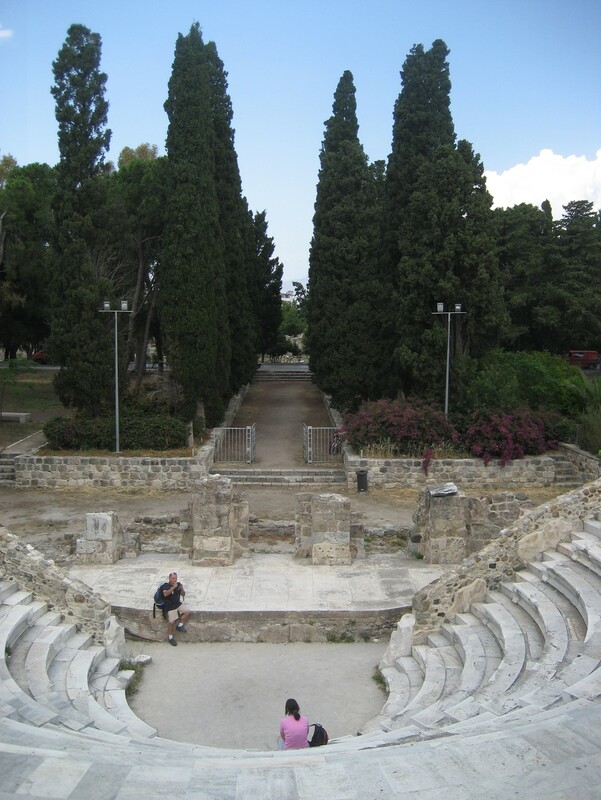 The island of Kos was the home of Hippocrates, the father of medicine. Like most of these port cities Kos was protected by a castle. 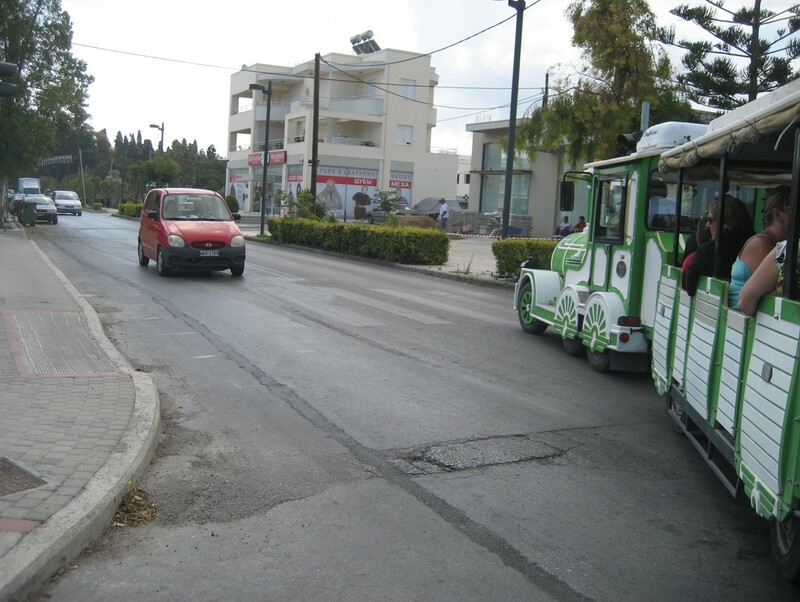 We began our visit by taking a tram on a route that pointed out the major sites to visit. At the entrance to the fortress is one of the country’s largest Plain Trees. 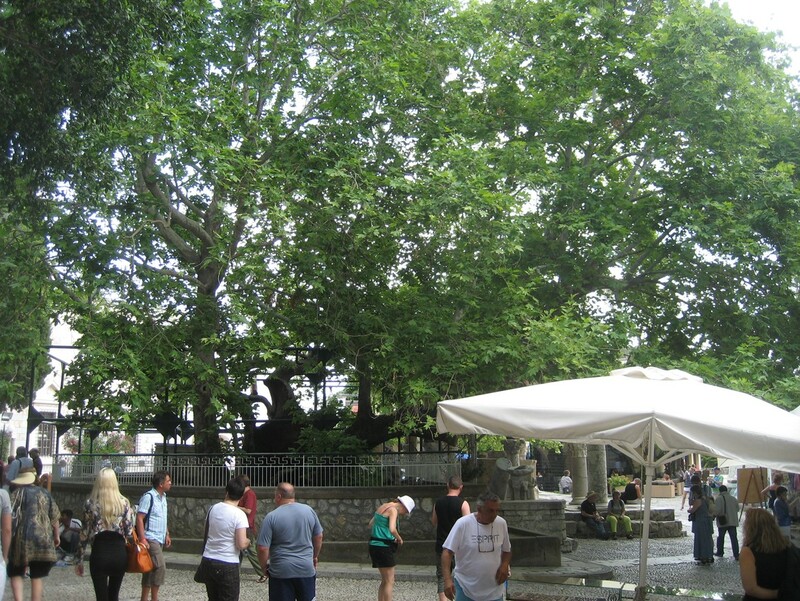 Legend says that it was under this tree that Hippocrates conducted healing sessions with his patients. This is the Neratzia Fortress located at the docks. 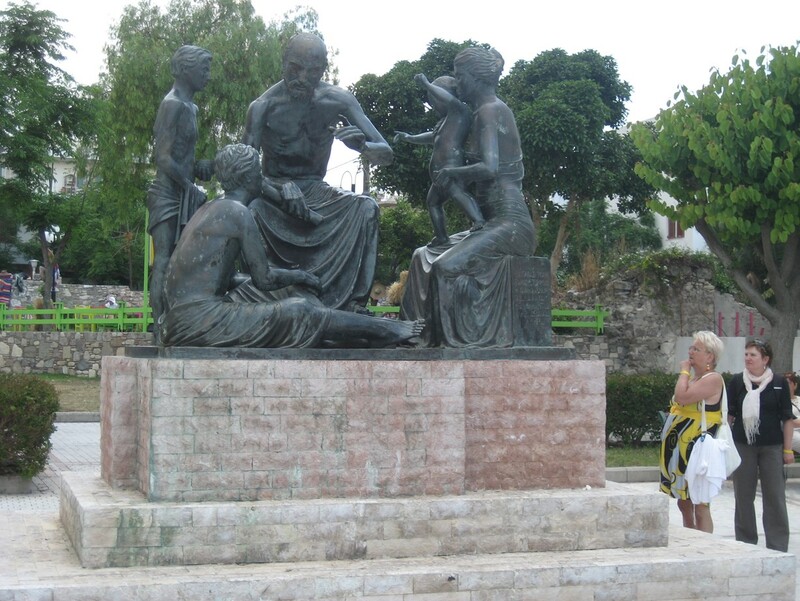 In the center of the city is the monument to Hippocrates. We rented bicycles to get around the town more easily. Here a local ‘beach boy’ is helping Pat with directions. 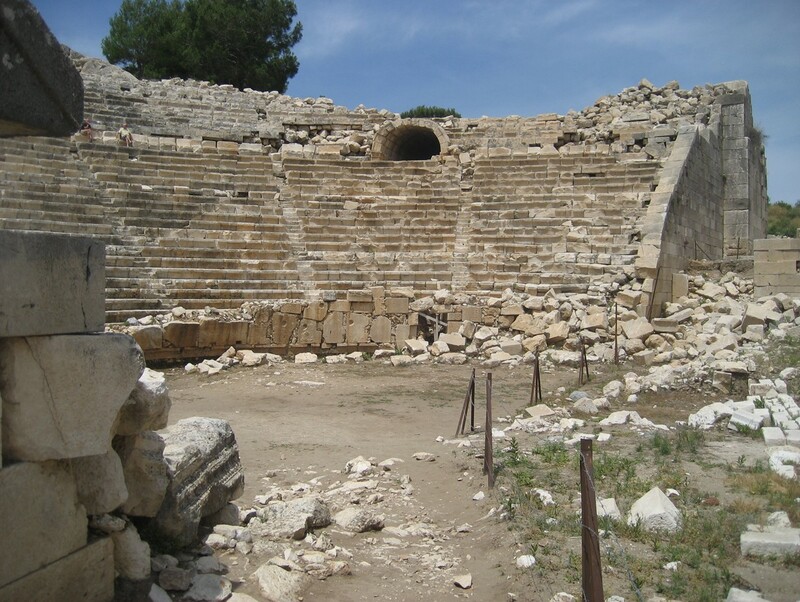 The odeum below was constructed in the 2nd century A.D. in the southwest quarter of the Roman City. 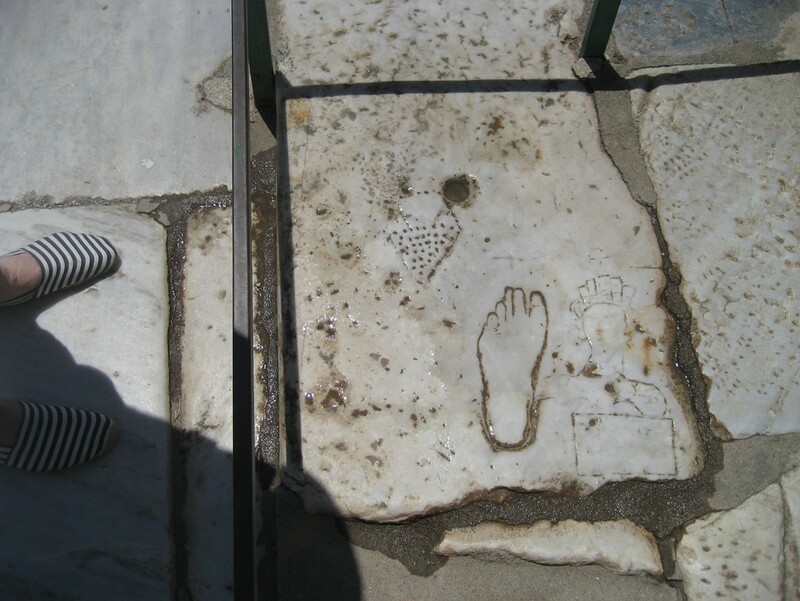 The monument was damaged by the earthquake in A.D. 142 and was repaired during the reign of Emperor Antonius Pius (A.D. 137 – 161). We rode back into town and returned our bikes. 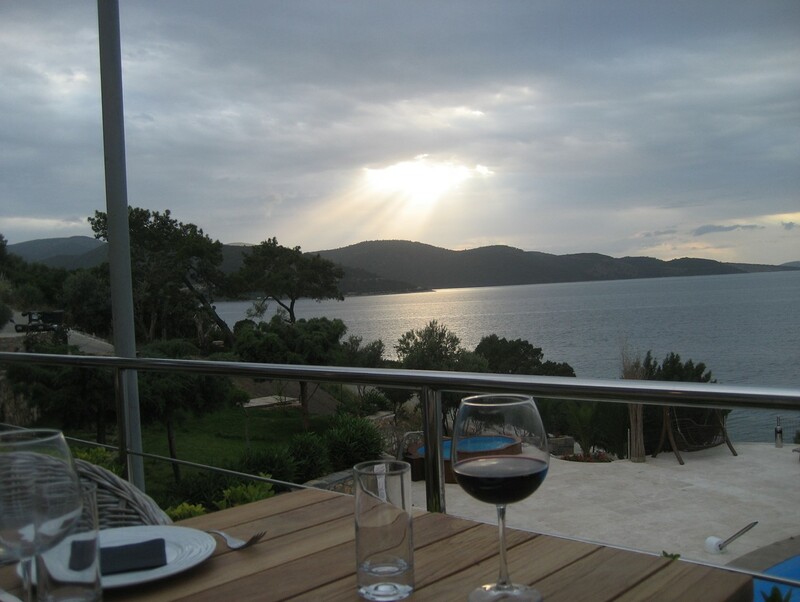 We enjoyed a late lunch, boarded the ferryboat and returned to Bodrum. 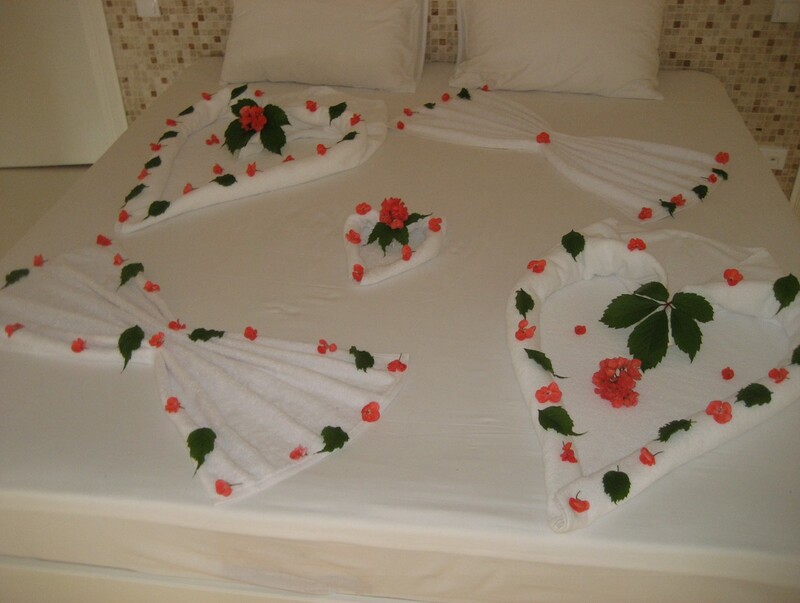 When we got to our room we found the maids had decorated our bed. Following breakfast we checked out and drove our rental car to the Bodrum airport. Surprisingly, we found nowhere to return our rental car. Fortunately, we found someone who called the local number for National Rental Cars and they sent someone over to us to pick up the car. in the old section of the city. The ancient city of Constantinople is now called Istanbul and it is a crossroads for commerce between the East and the West. 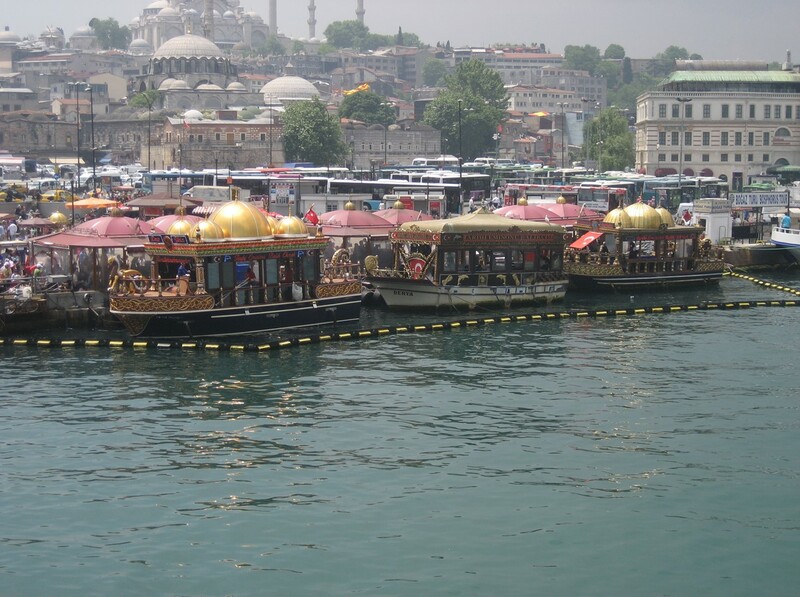 The city of Istanbul straddles both Europe and Asia. 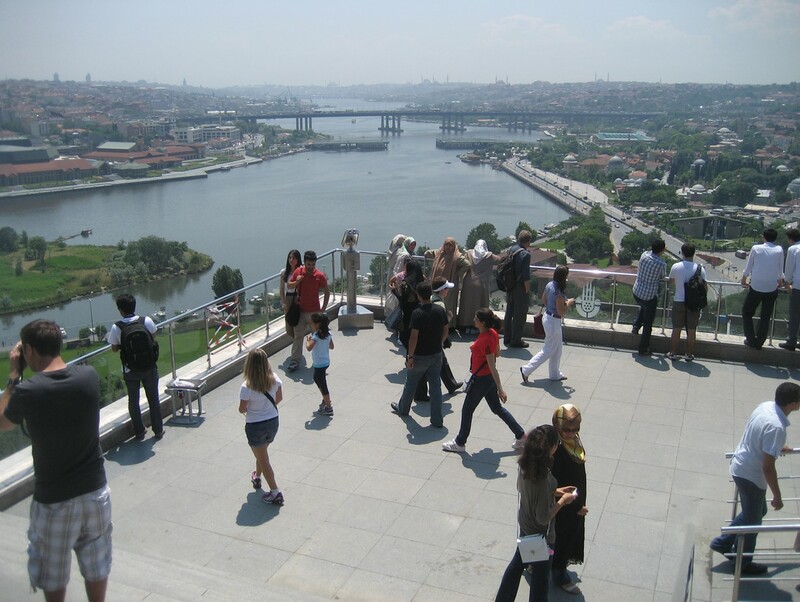 In Europe there is an old section and a new section separated by the Golden Horn. 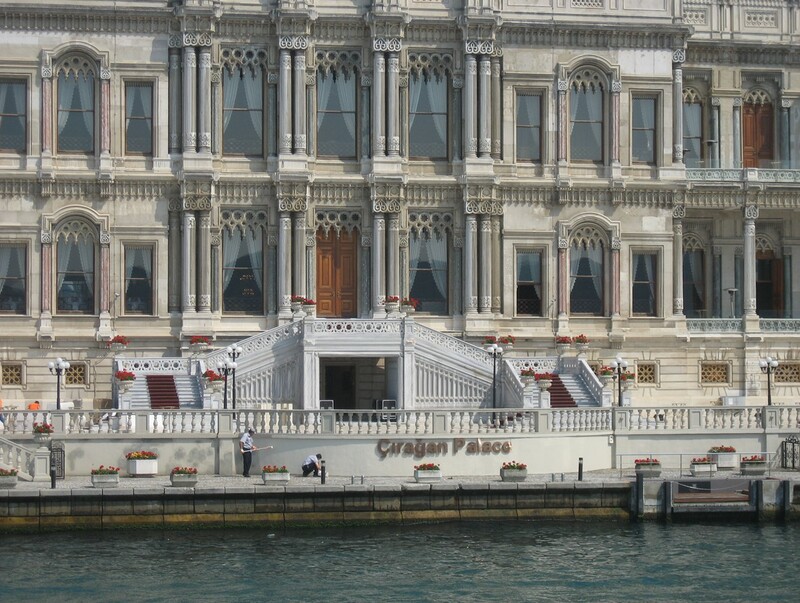 The Bosphorus separates the European section from the Asian section. We unpacked and began our walk to discover the city. 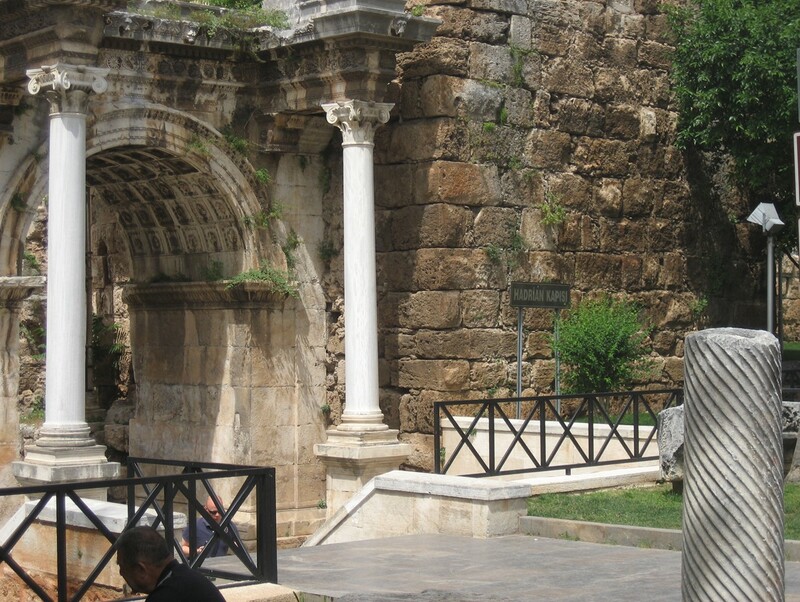 Very near our hotel were the remains of the Byzantine Triumphal Arch. From this pillar all distances in the Roman Empire were measured. 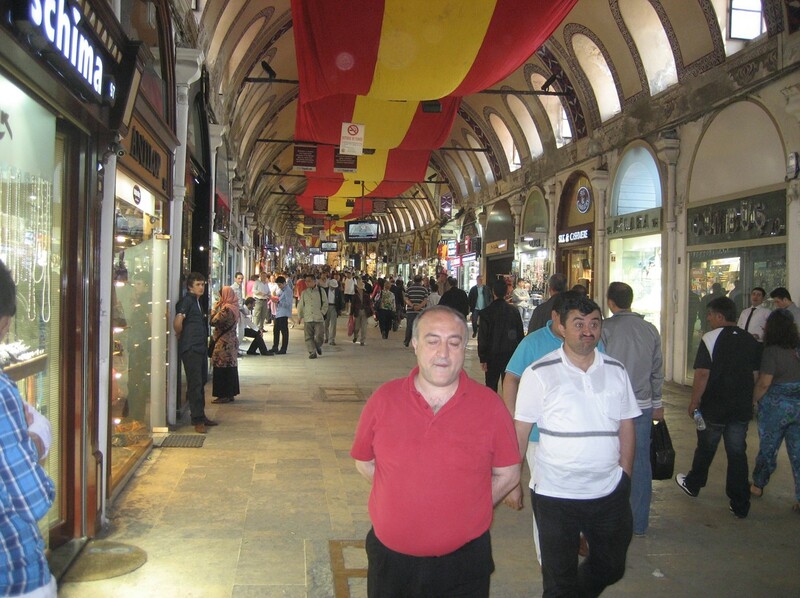 We then walked up the hill (it seemed everything in Istanbul was uphill) to the famous “Grand Bazaar” and spent some time wandering the halls and being solicited by all the vendors. 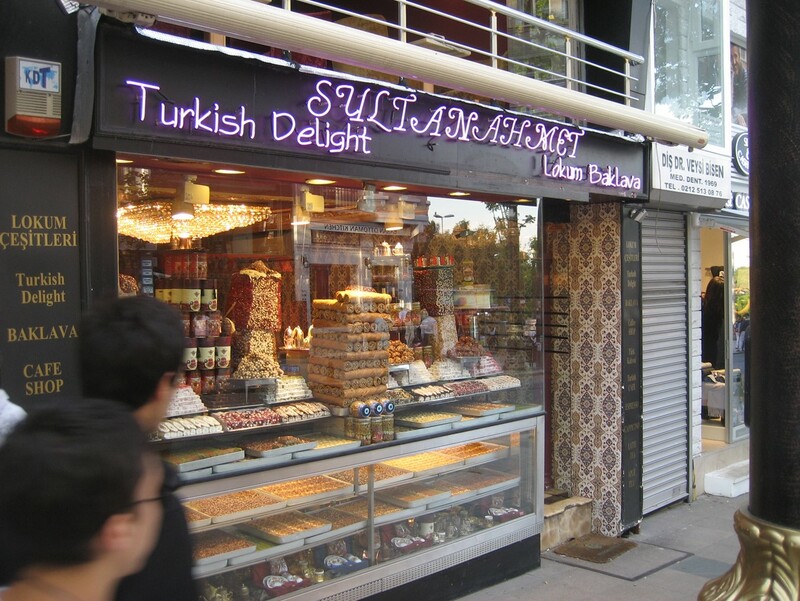 Just wandering around the city, there were many sweet shops such as below. 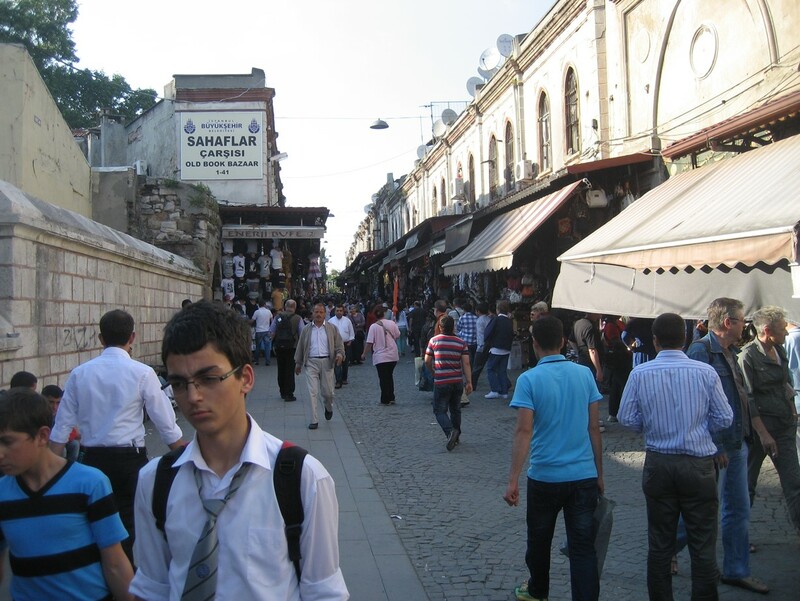 For this day we were following a walking tour in Rick Steves’ book ‘Istanbul’. Our first stop was Hagia Sophia. 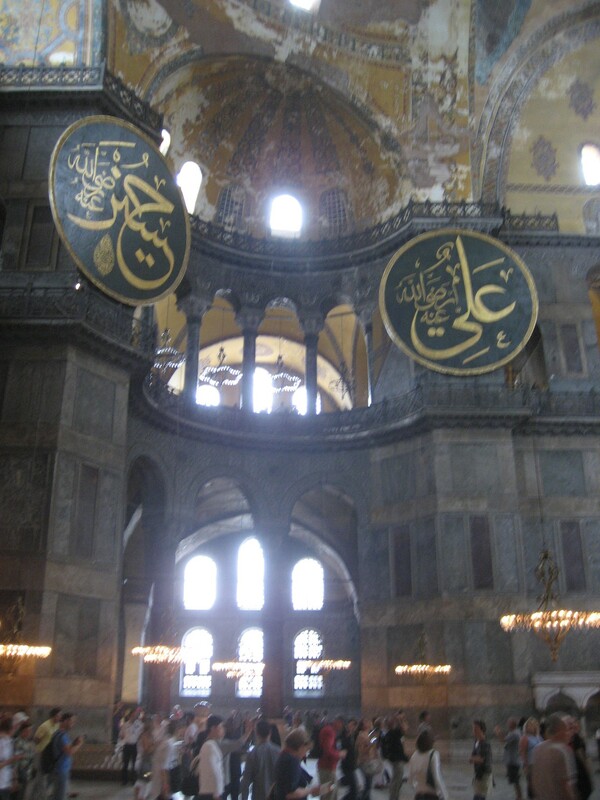 Hagia Sophia was initially built as an Orthodox patriarchal basilica. Its design is quite daring with a massive two tiered domes supporting the huge weight of the ceiling. After the conquest of Istanbul in 1453 by the Turks and Sultan Mehmed II, Hagia Sophia was turned into a mosque, and in 1934 into a museum. The building is so massive that pictures just don’t do it justice. The original pulpit was moved to realign it with Mecca. 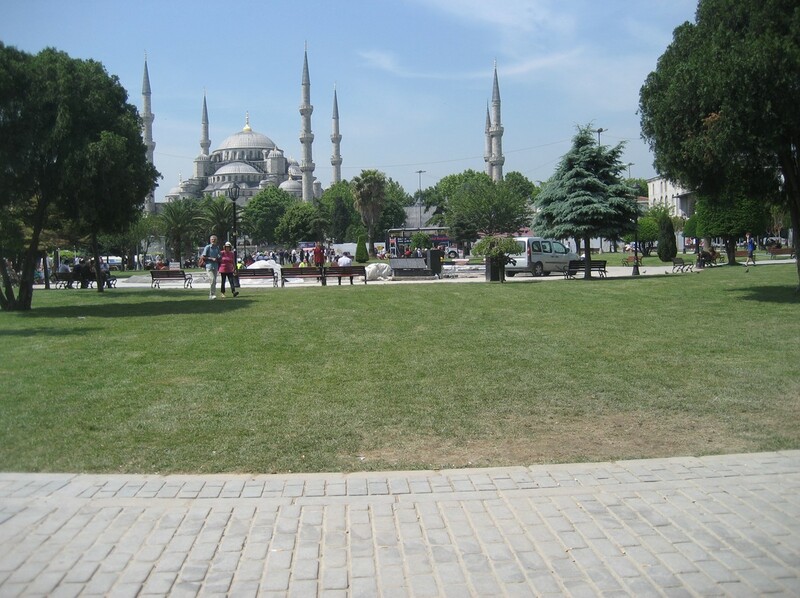 The next stop was the famous Blue Mosque. This is one of the largest mosques outside of Mecca. The number of minarets indicate the importance of the mosque and with six, this is extremely important. We went inside the mosque and to do so we had to remove our shoes and Pat had to cover her head with a scarf. 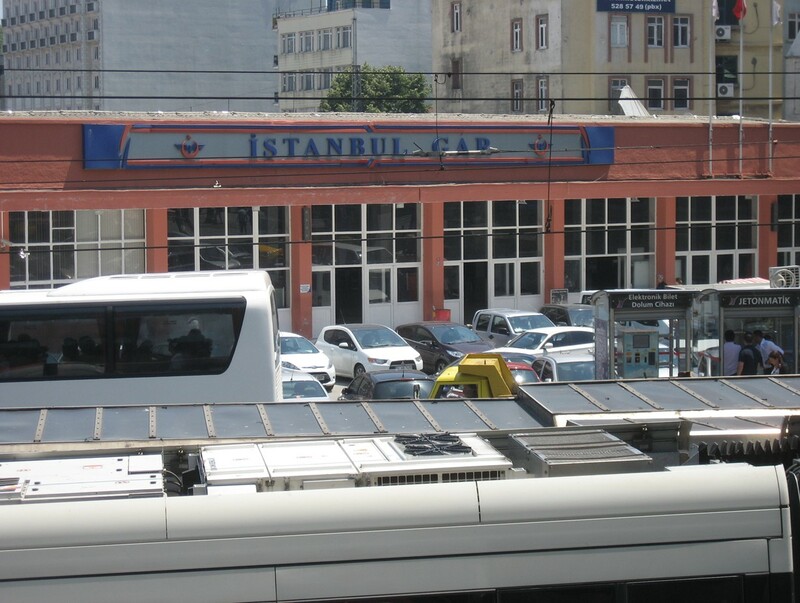 After visiting the Blue Mosque we took a tram ride across the Bosphorus to the New District side. We intended to have lunch at the Istanbul Modern (art museum) but a huge cruise ship blocked any view we might have had so we walked back down to the bridge. 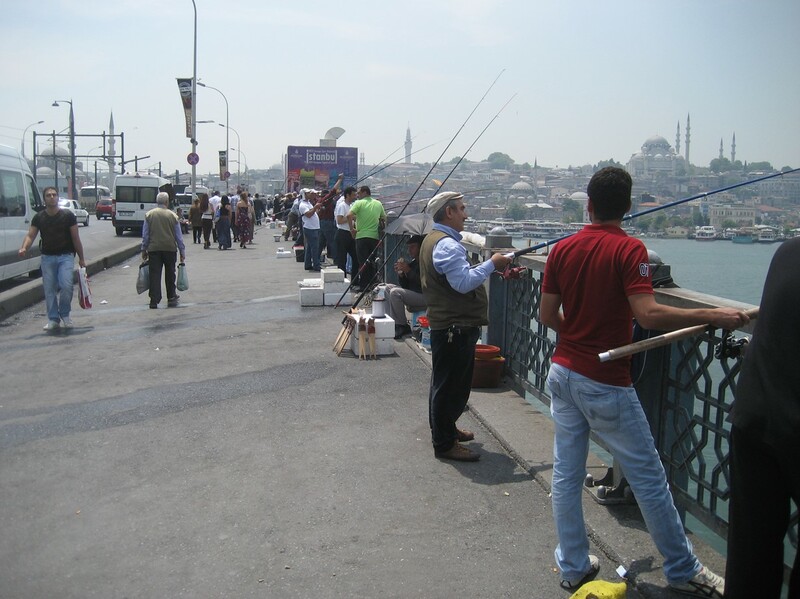 Here we found lots of people fishing – but not so much catching. This was getting late in the afternoon and all of the tour boats were back in the harbor. 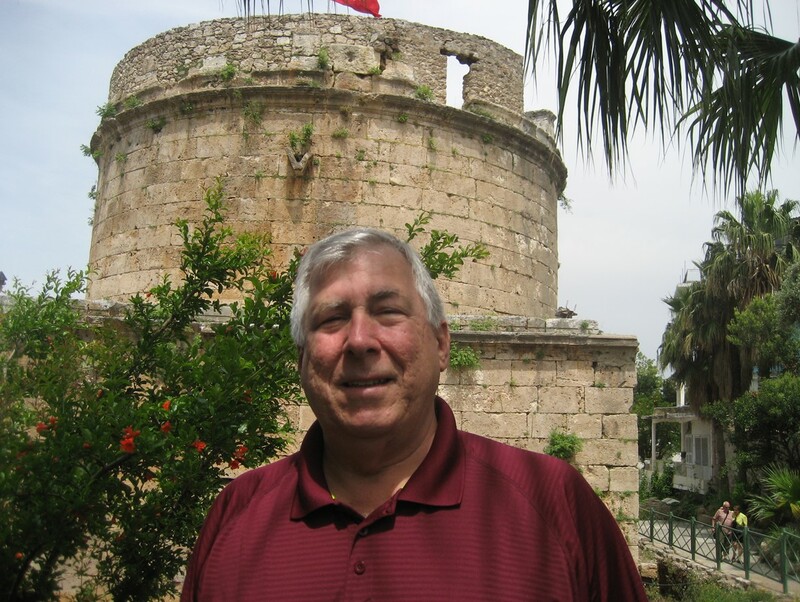 This was our last full day in Turkey and we scheduled a boat tour of the Bosphorus Strait. This building has not weathered well and the guide said it is now used as an ambassador’s residence. As we approached the first bridge to span Europe and Asia, we saw the castles constructed to defend this passage to open water. The boat then made a 180 degree turn and went back to the city along the Asian coast. Directly opposite the European-side castle was a somewhat smaller one on the Asian side. 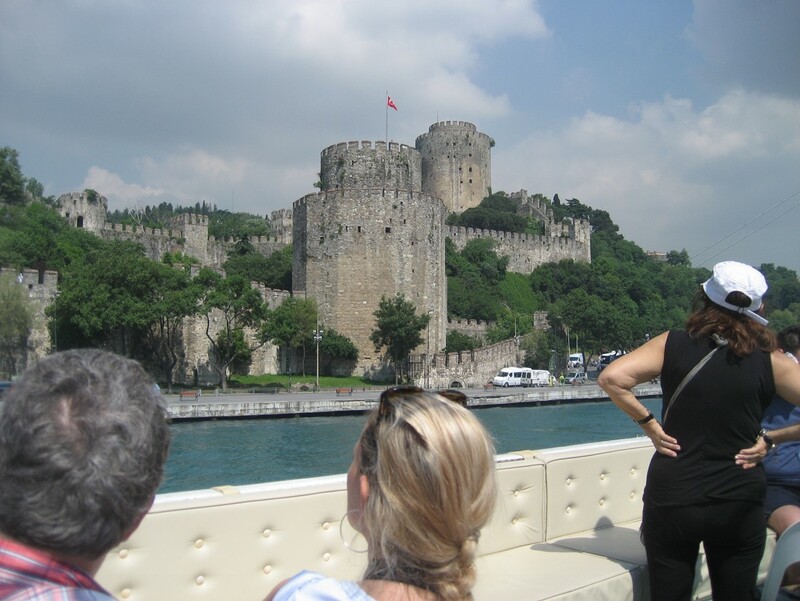 Our tour continued with a bus ride up the Golden Horn which is the opposite direction from the Bosphorus. This ride to the top of the hill overlooking Istanbul gave us a very good view of the Old and New Districts. 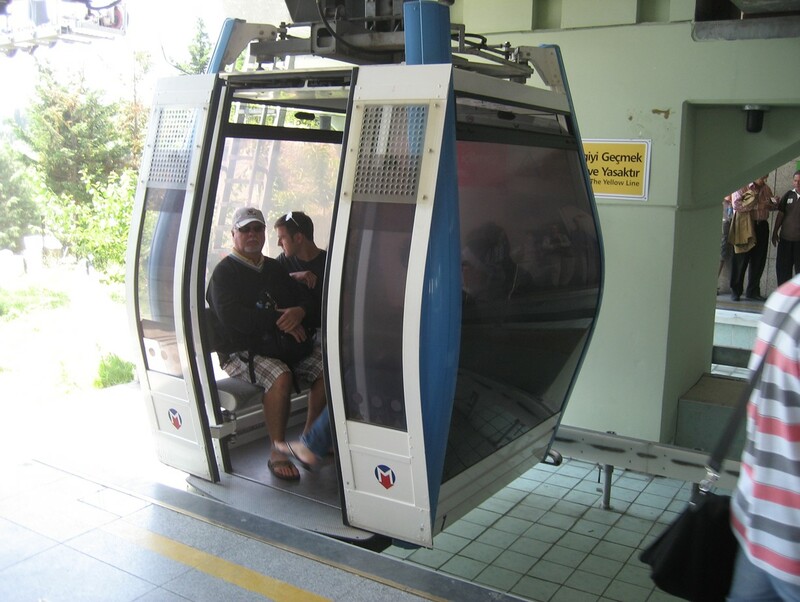 The tour culminated with a cable car ride down from the top of the hill and a bus ride back to the city. We elected to be dropped off at the Spice Market. 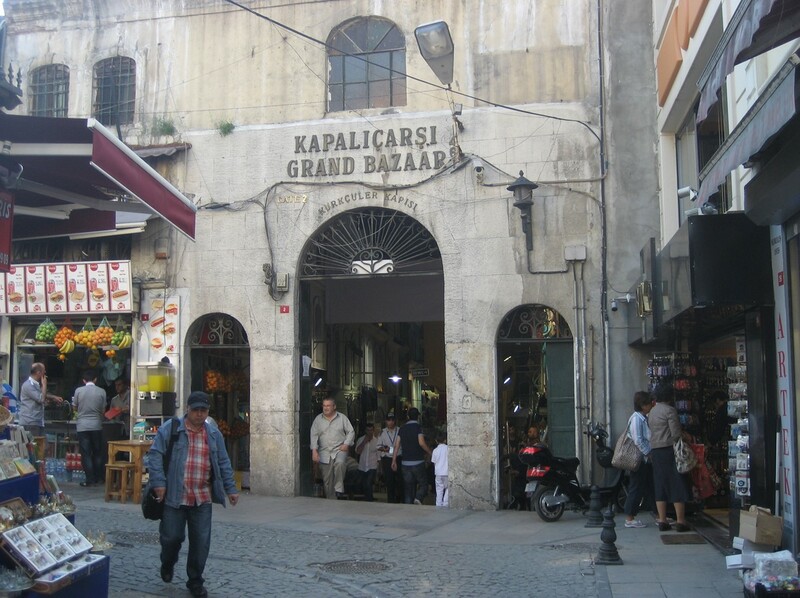 While similar to but much smaller than the Grand Bazaar it is still a sight not to be missed. We walked the short distance back to our hotel and stopped for a sandwich directly opposite the train station where the famous Oriental Express terminated. This was a train that ran from Paris to Istanbul. 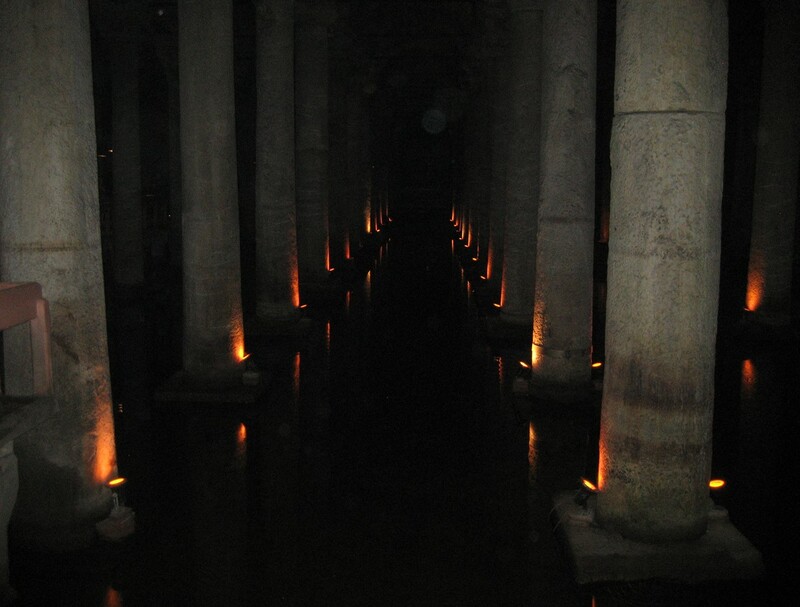 The last stop on our visit to Istanbul was to tour the Basilica Cistern. 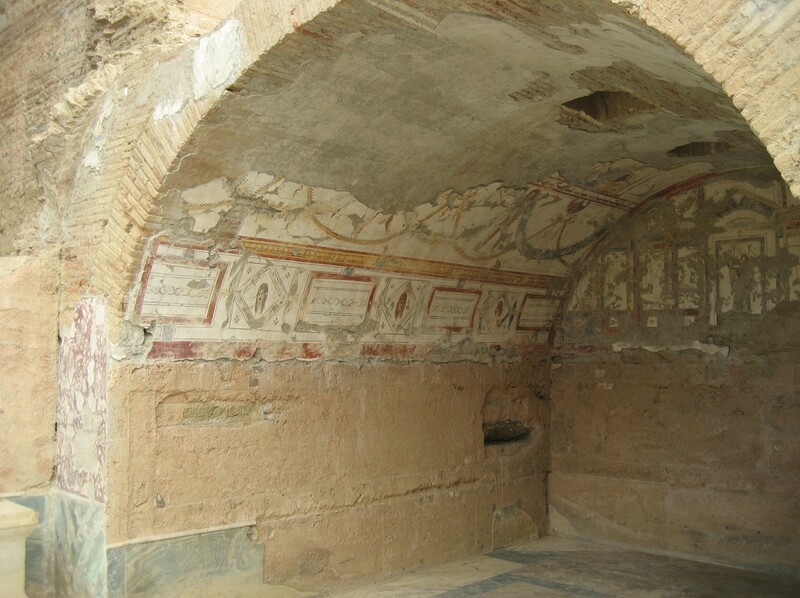 This huge underground cistern was built during the reign of Emperor Justinianus in the 6th century – the age of glory for Eastern Rome. The cistern covers an area of 9,800 square meters. There are 336 marble columns in 12 rows. The cistern’s water was provided from the Belgrade Woods which is 19 km north of the city via aqueducts built by the emperor. 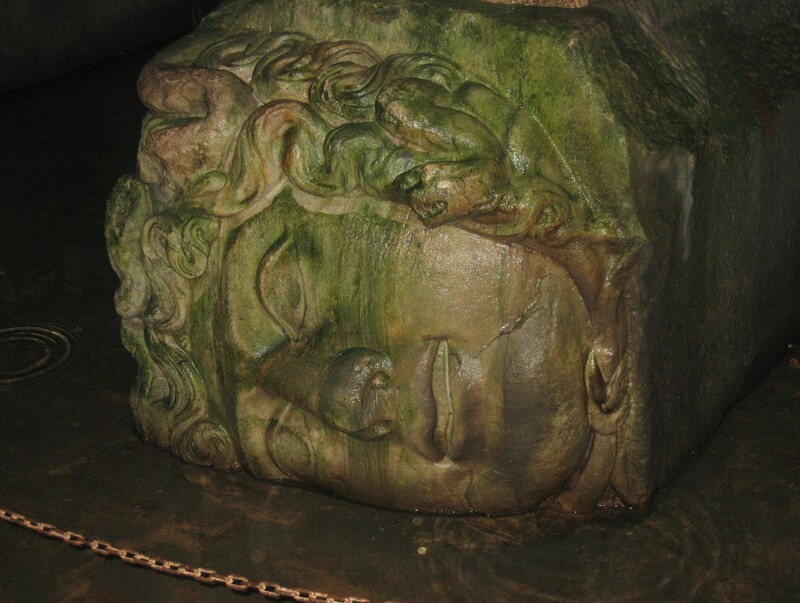 The two Medusa’s head columns were there to ward off attackers. We were told that the cistern was forgotten about for centuries. Residents would drill for water and always found it. Eventually, they uncovered some of the roof and realized what they had. 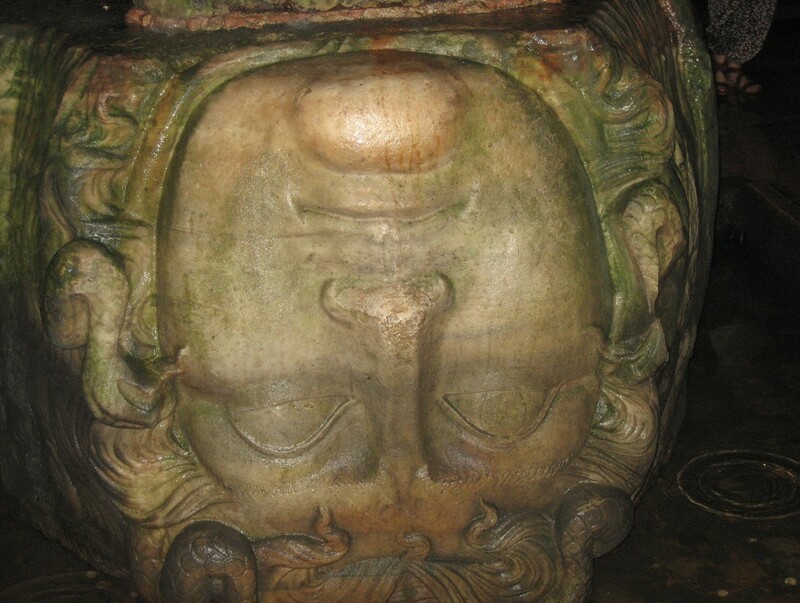 The Medusa head below is actually upside down on the column. This was our day to return to Chicago. 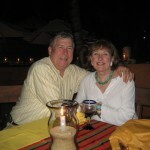 We enjoyed a leisurely breakfast, packed our bags and caught a taxi back to the airport. We absolutely loved our two weeks in Turkey. The weather was perfect. We enjoyed several days lounging on the beach. We had a fantastic trip back to times and things we had only read about. 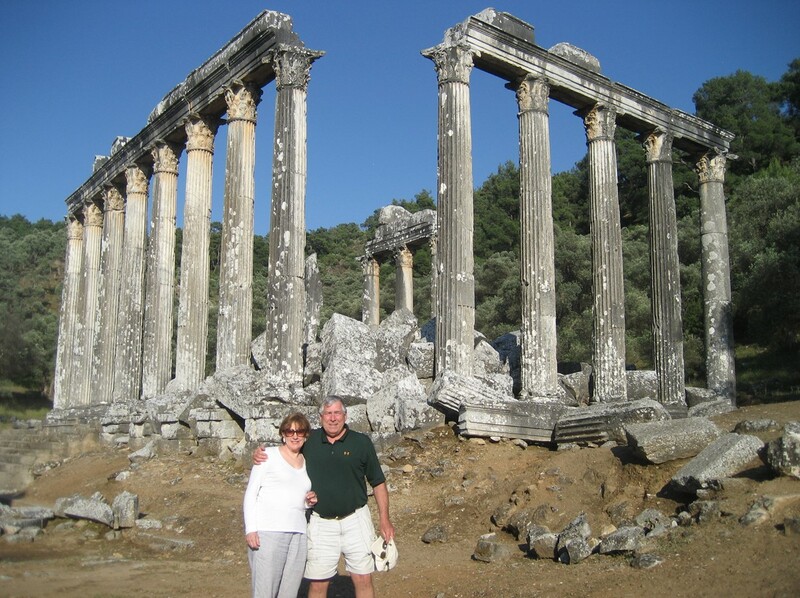 We learned so much about the people and the culture of Turkey. We have a lifetime of memories.